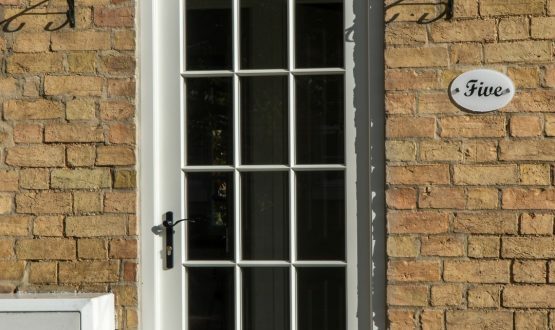 Timber French doors are an elegant choice for your property. 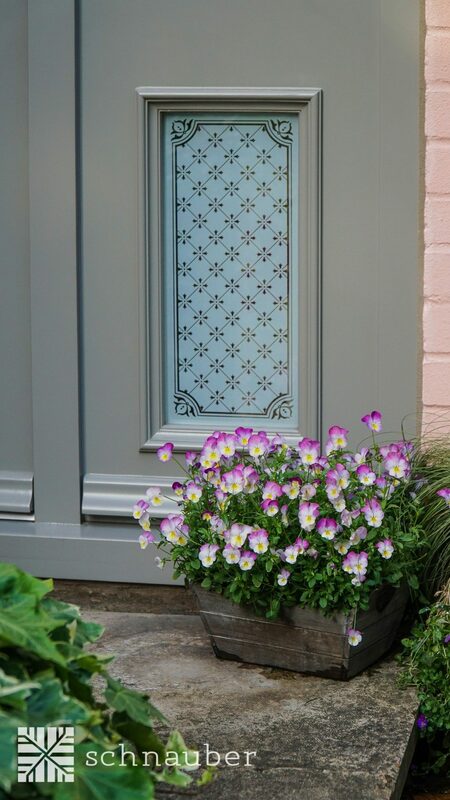 They make your home or building look classy and stylish. 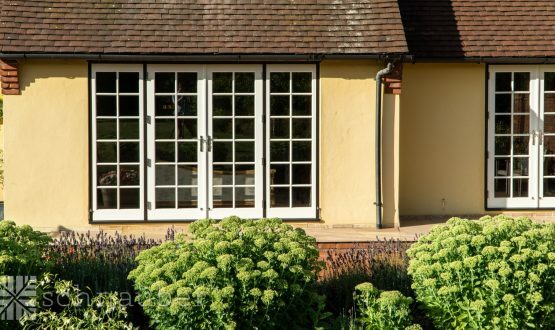 Whether you prefer classic or contemporary design, we tailor our timber French doors to bring out the beauty of your property. 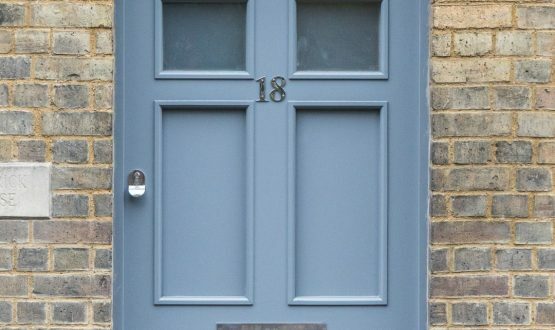 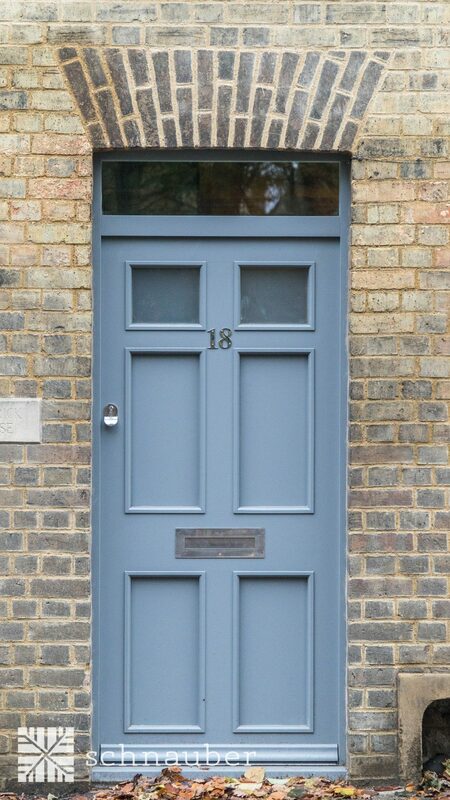 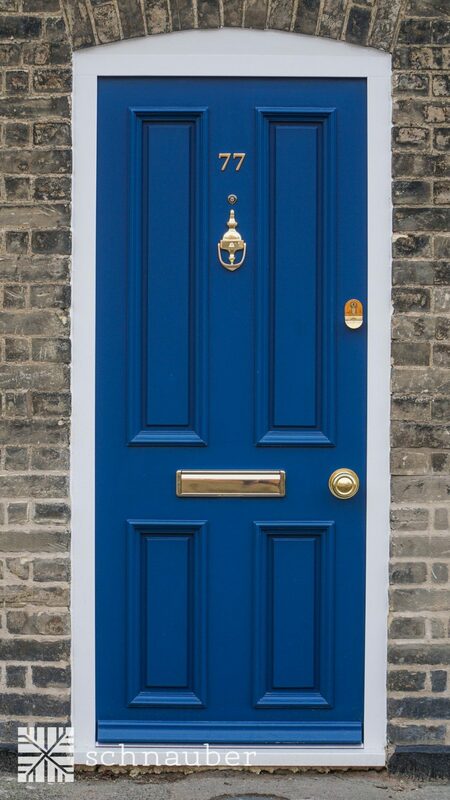 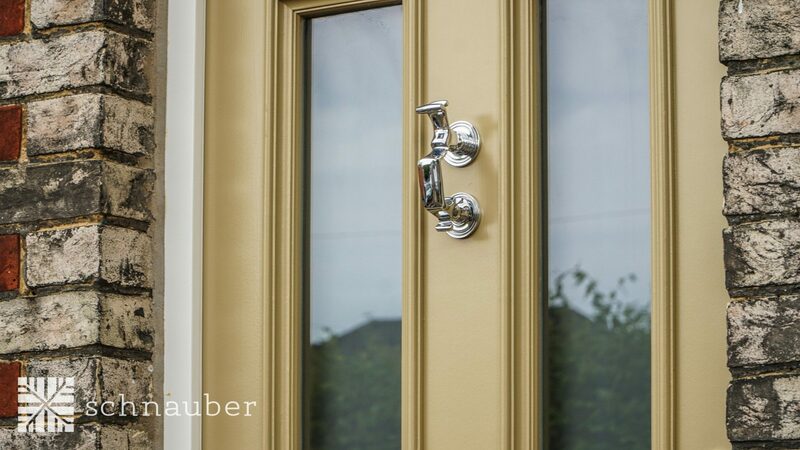 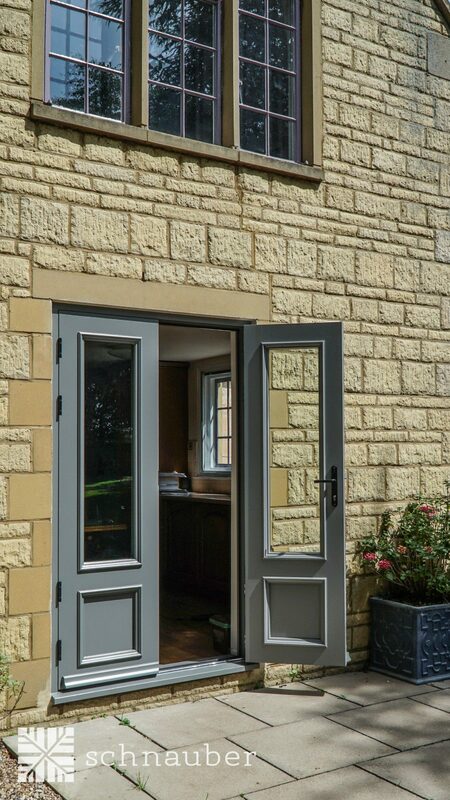 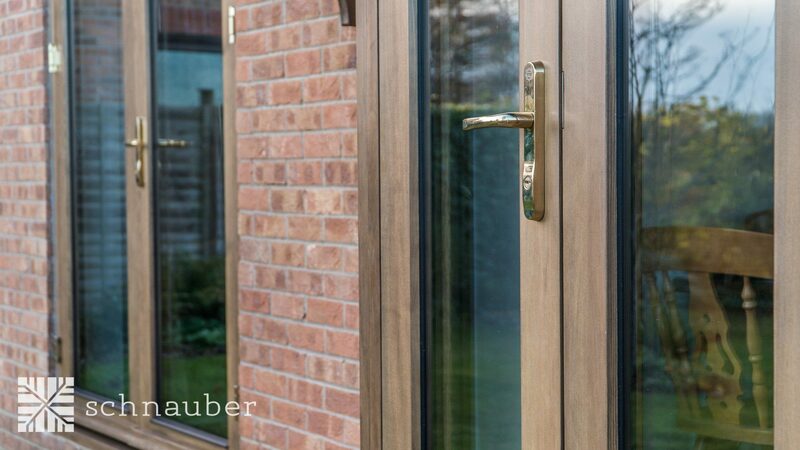 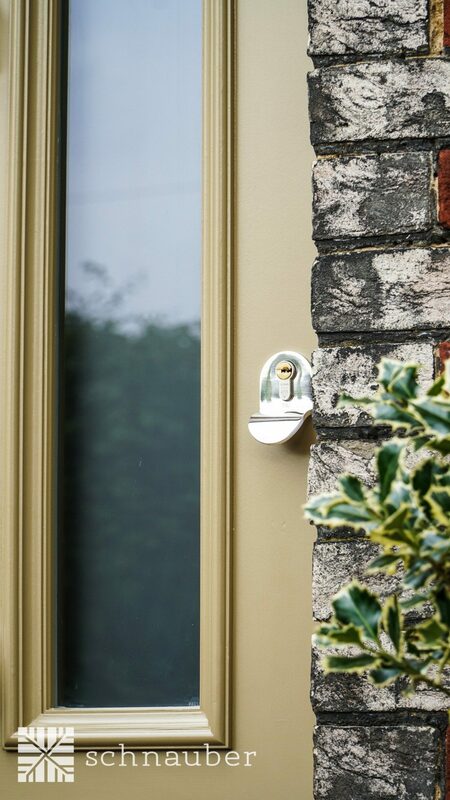 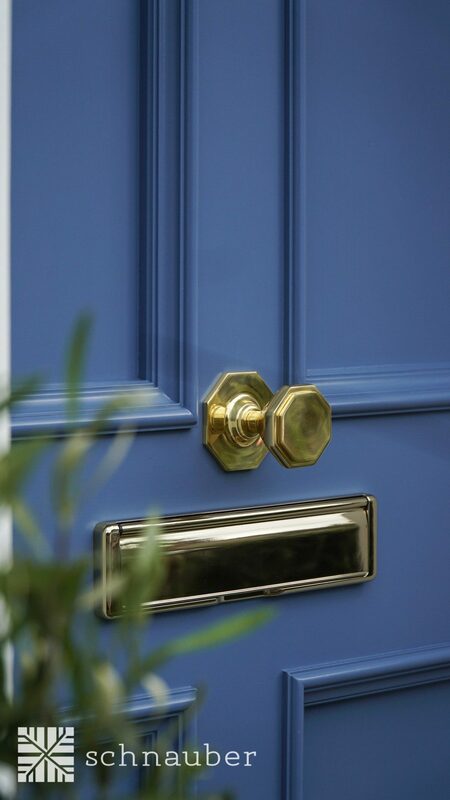 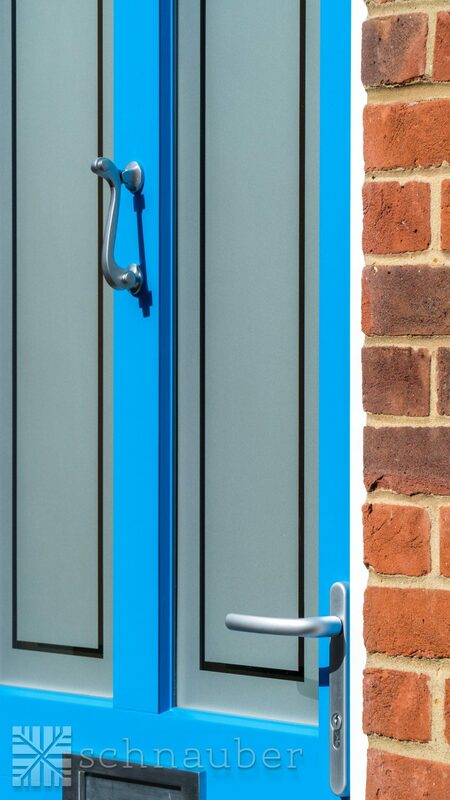 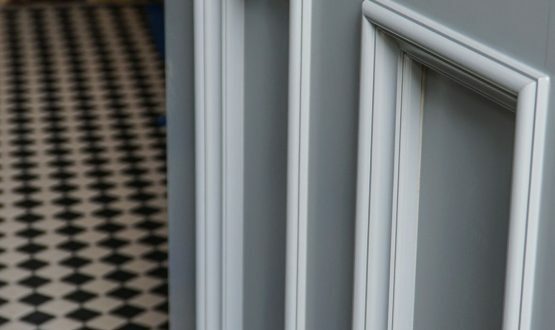 We offer a vast selection of colours, glazing and finishes to ensure your bespoke timber French doors meet your exact requirements. 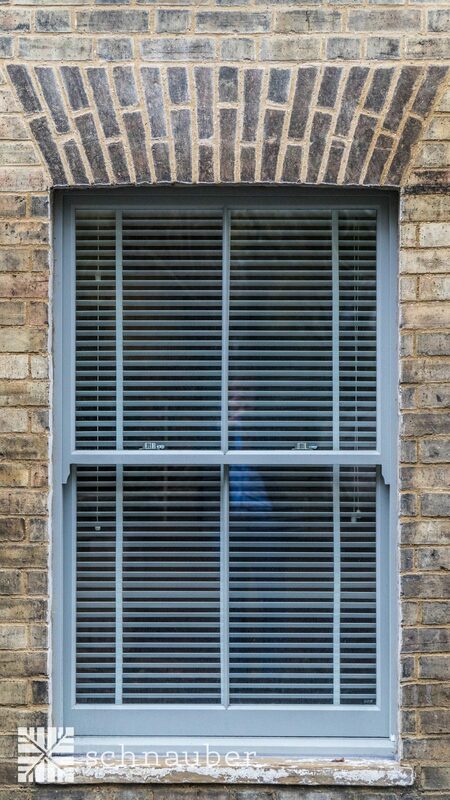 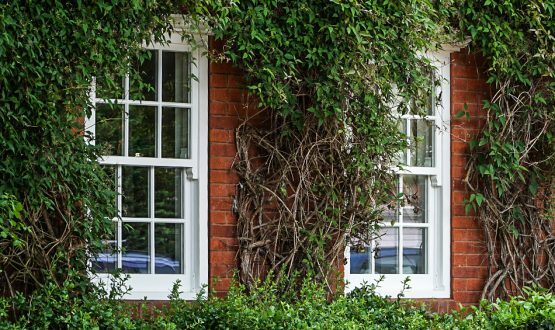 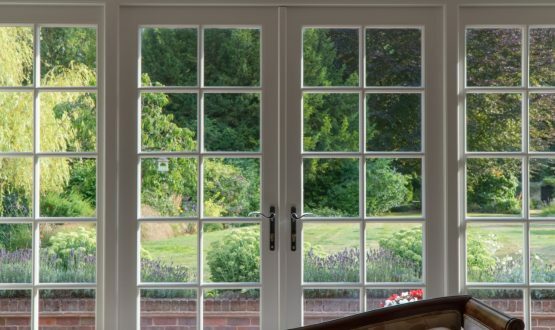 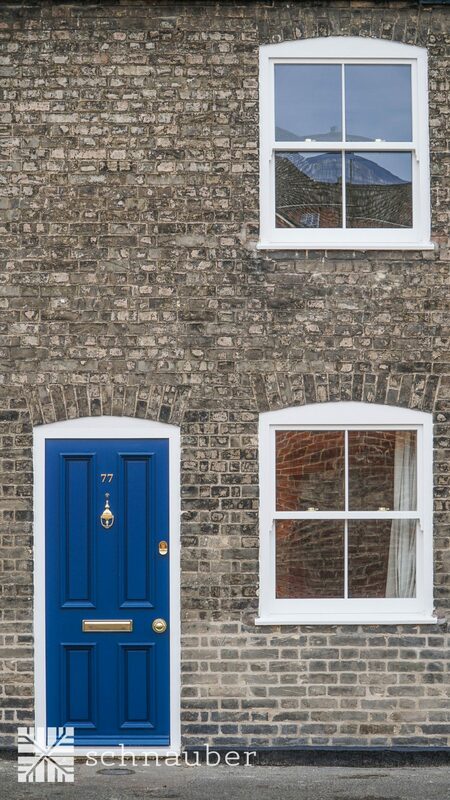 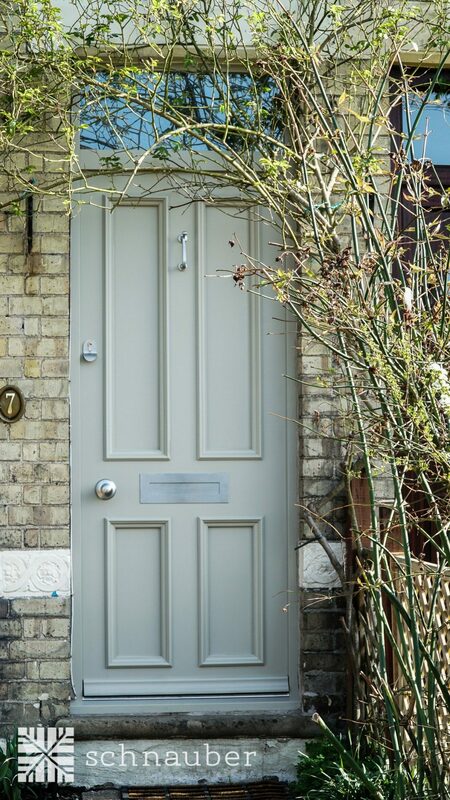 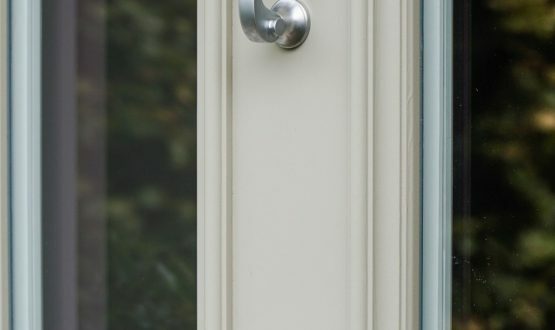 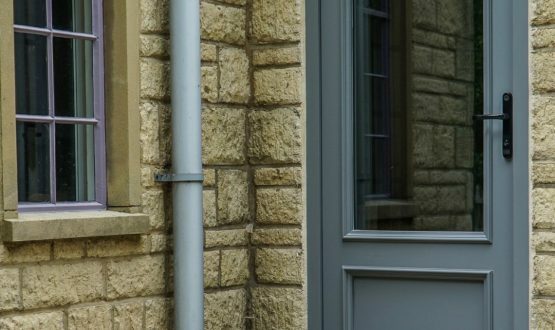 Our timber French doors are made from the most sustainable materials in the marketplace. 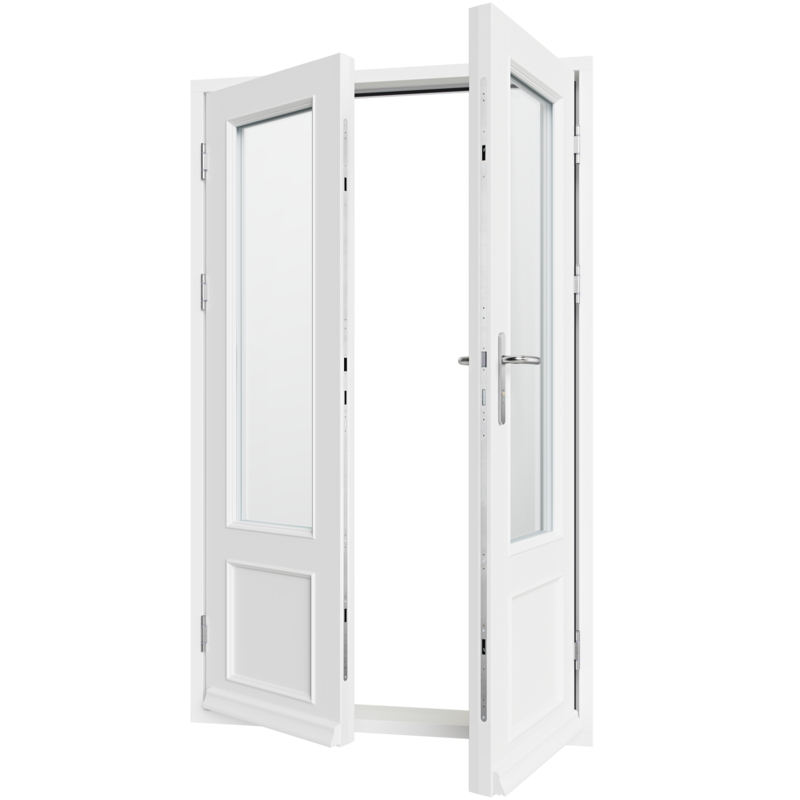 Each door is passed through rigorous quality tests before being dispatched to customers. 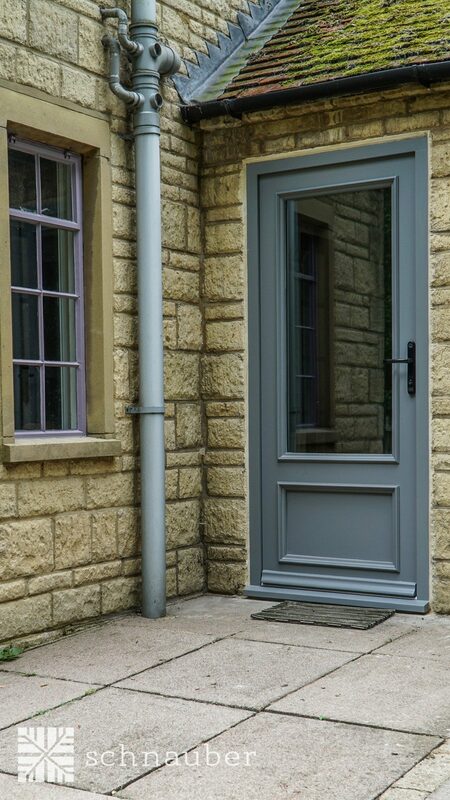 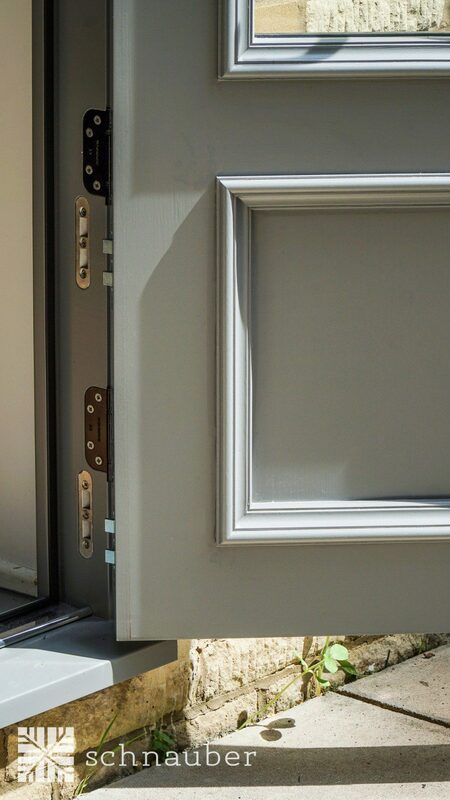 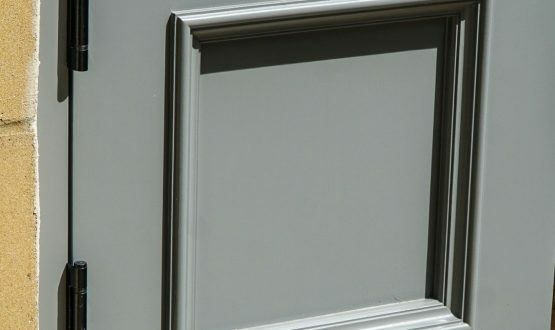 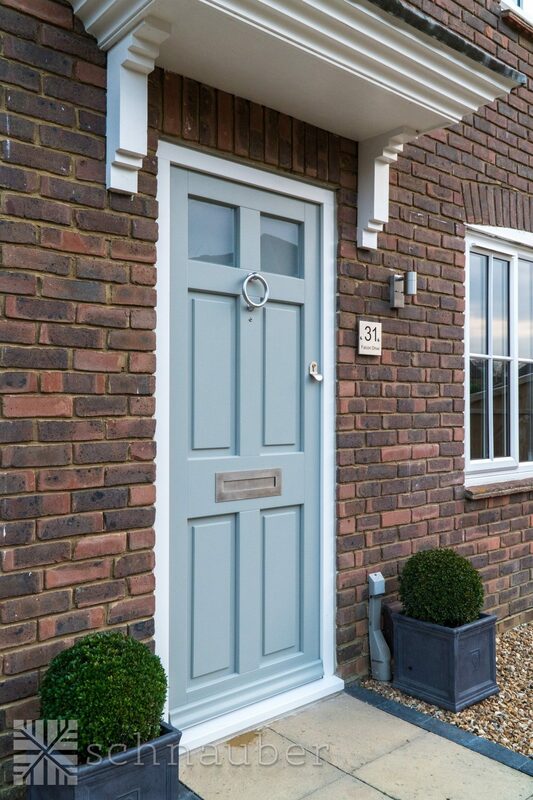 We use multiple finishing, LVL laminates and micro waterproof paints to reduce the U-value and improve the thermal insulation properties of our timber French doors. 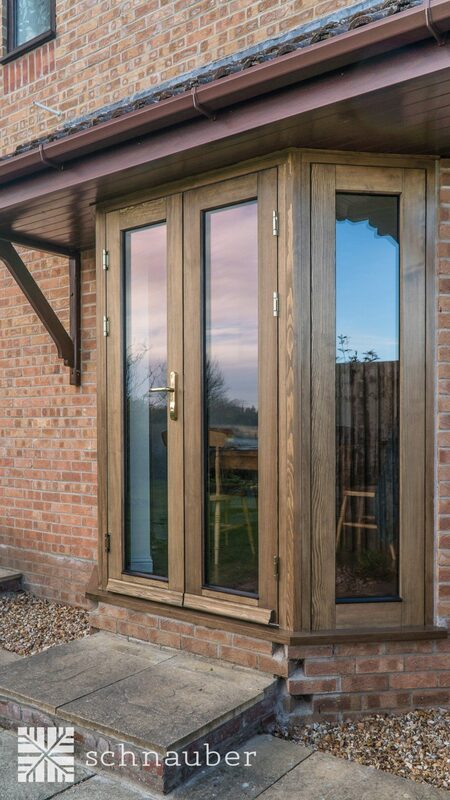 All our French doors have multi-point locking systems with advanced security mechanism to prevent unauthorised entry into your property. 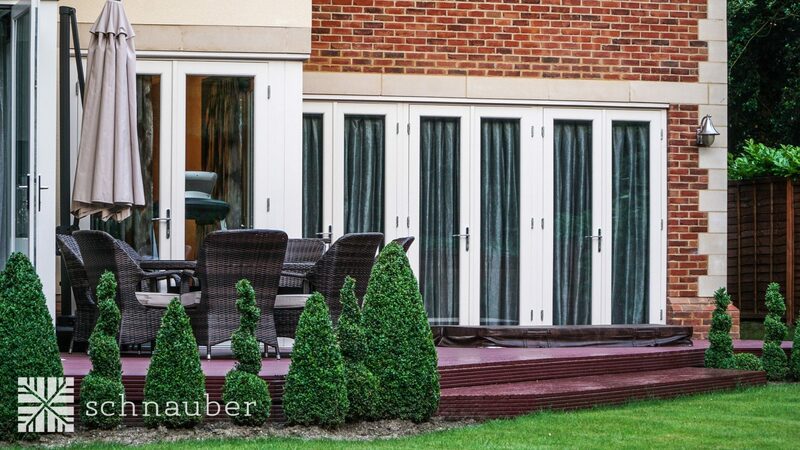 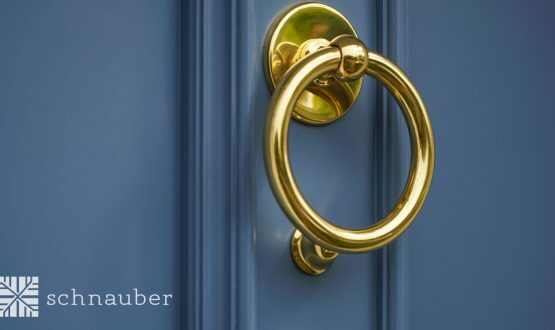 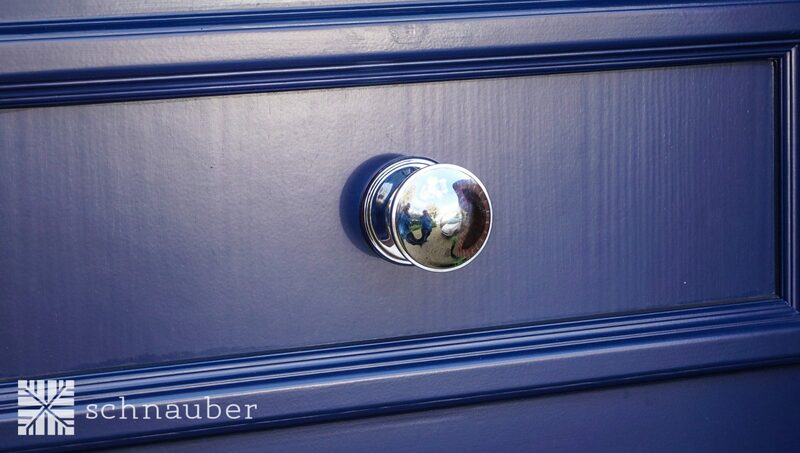 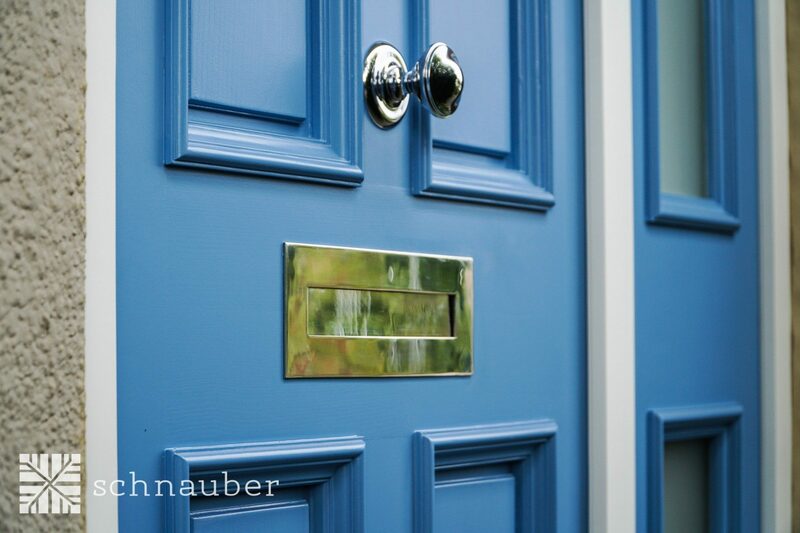 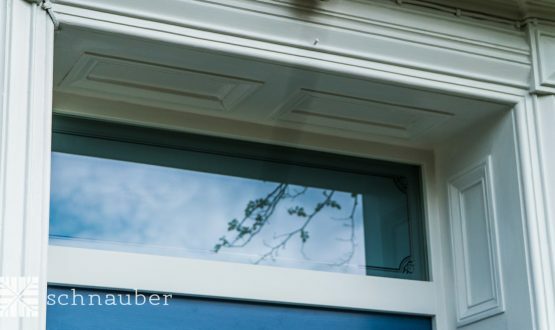 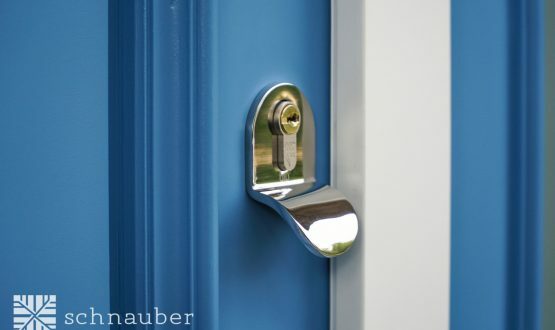 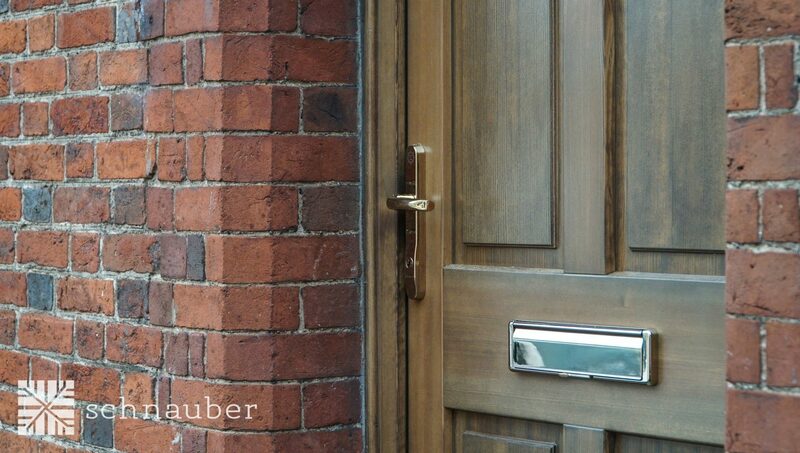 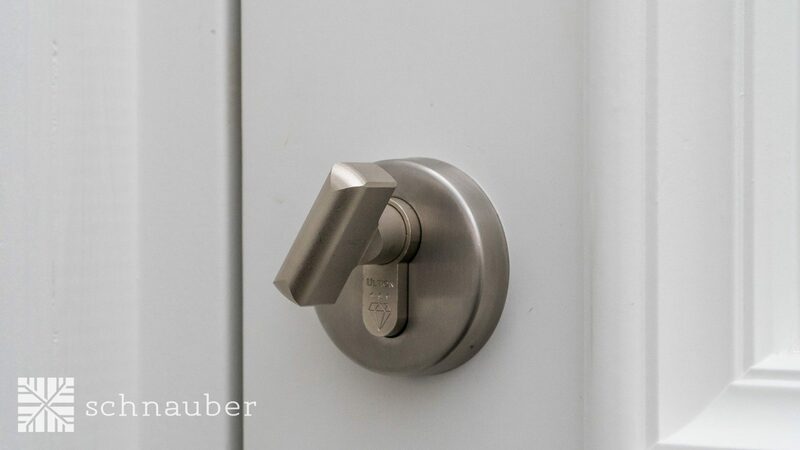 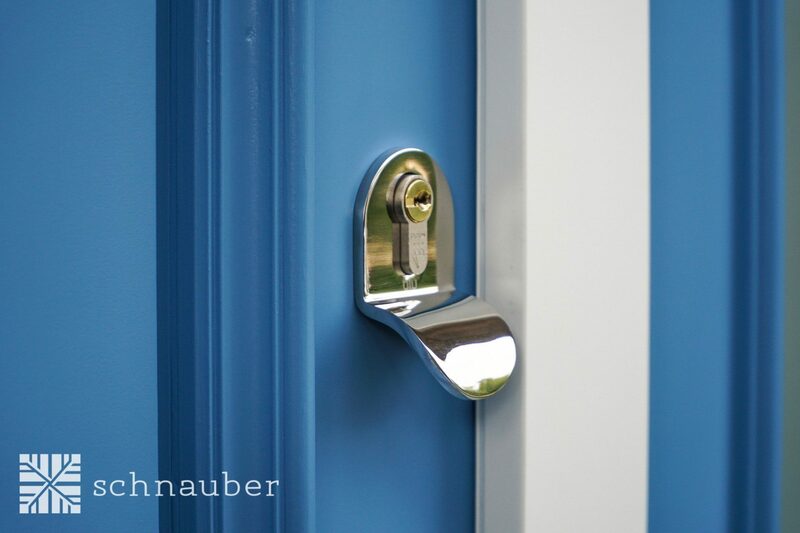 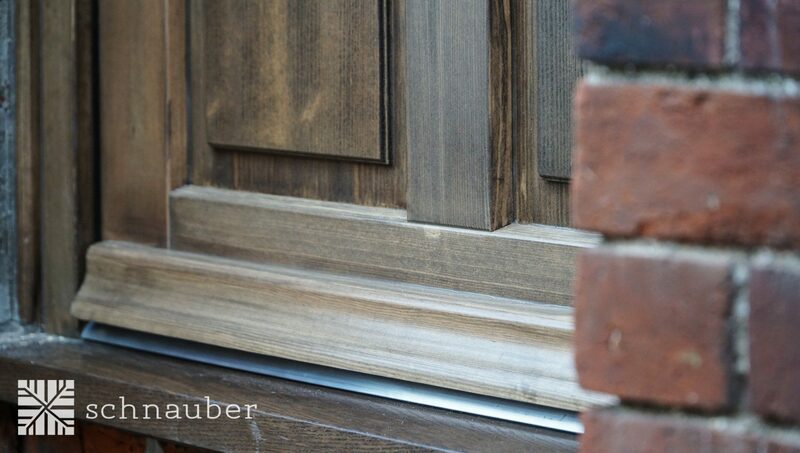 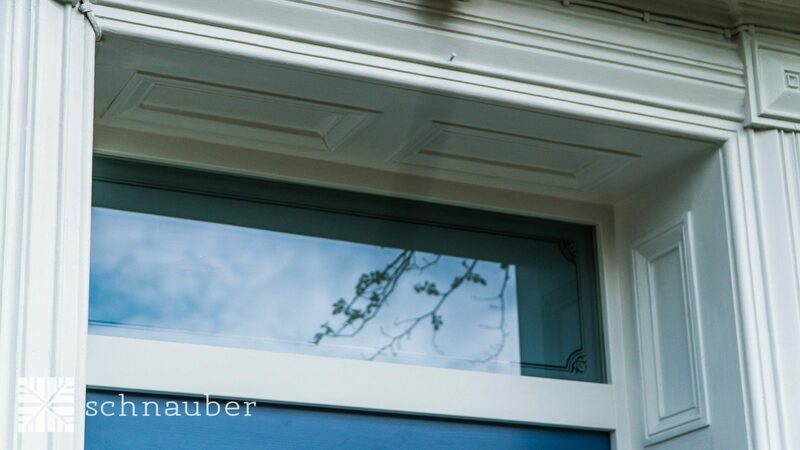 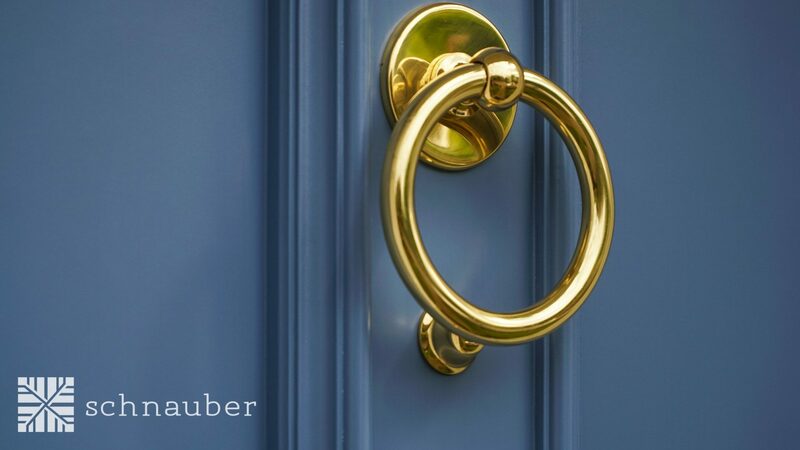 Schnauber wood French doors are tailored to suit your aesthetics, energy, and security needs. 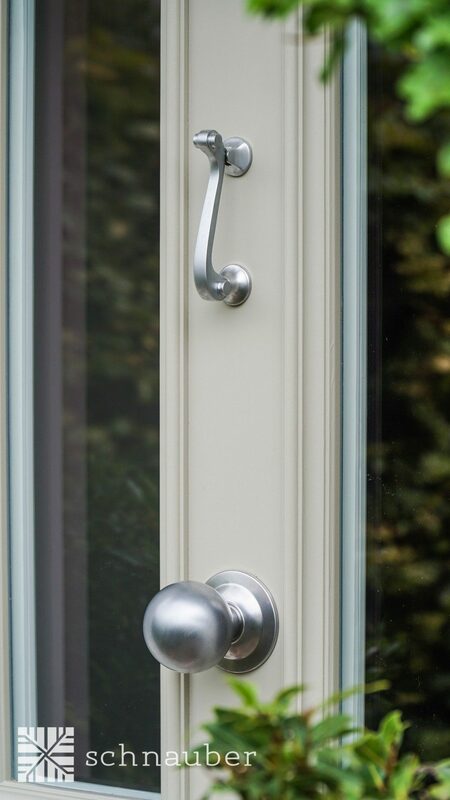 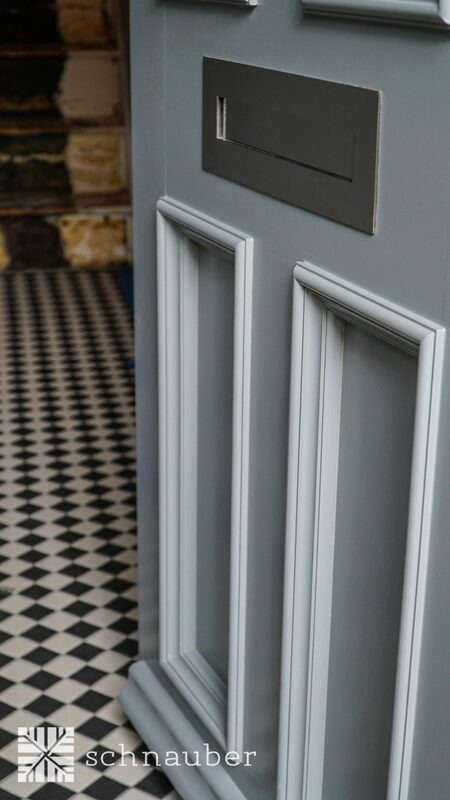 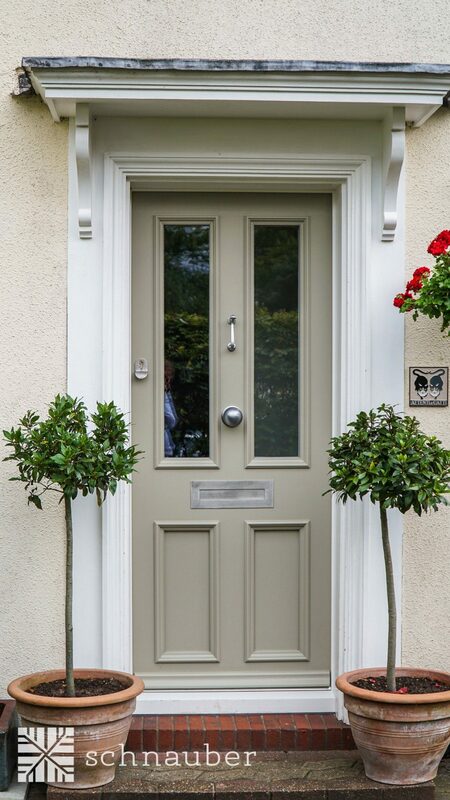 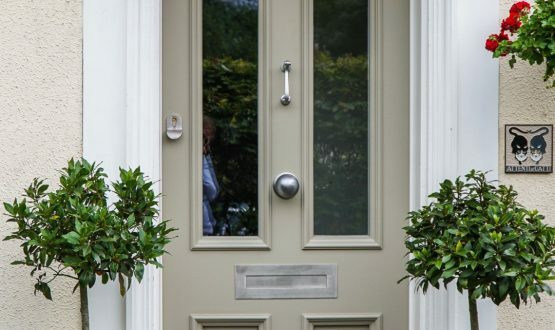 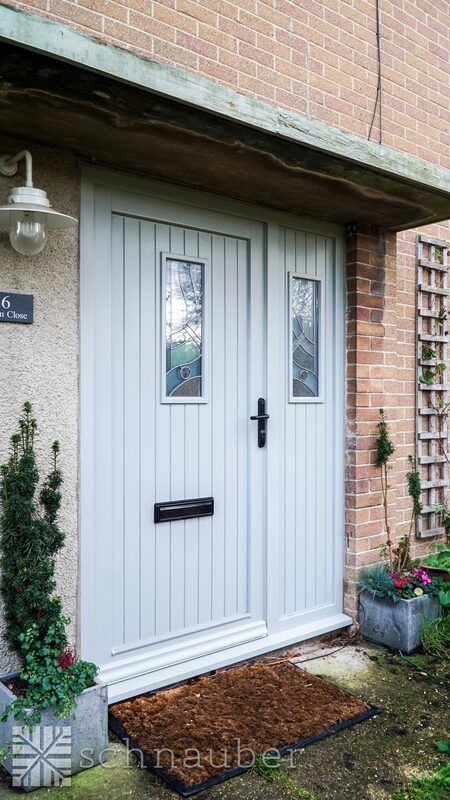 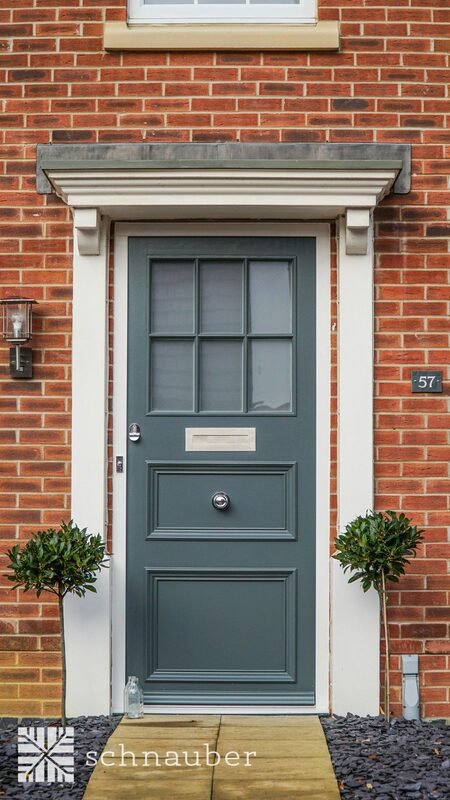 Our team of talented craftsmen know just how to make your timber French doors bring style an elegance to your home. 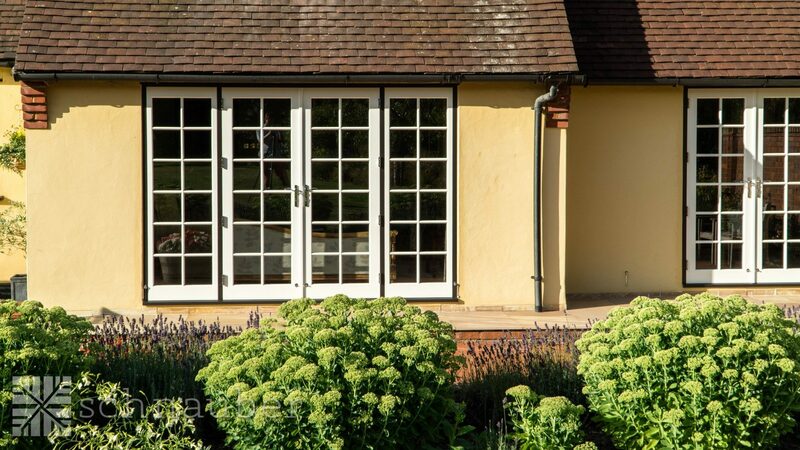 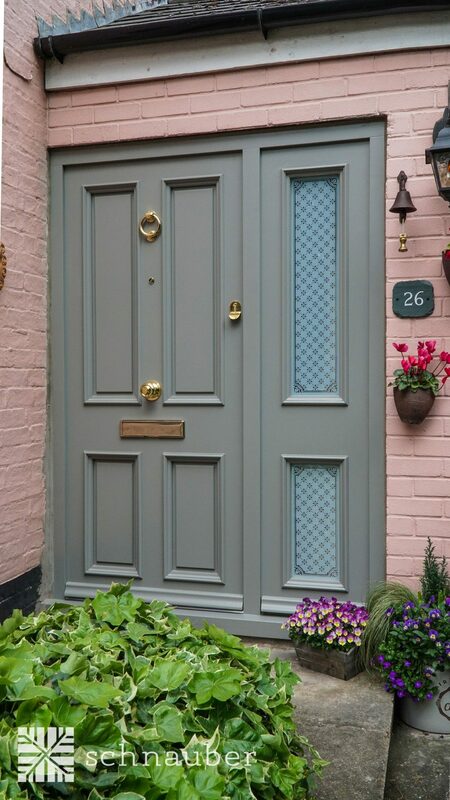 We have lots of design ideas to inspire you and ensure your bespoke timber French doors stand out. 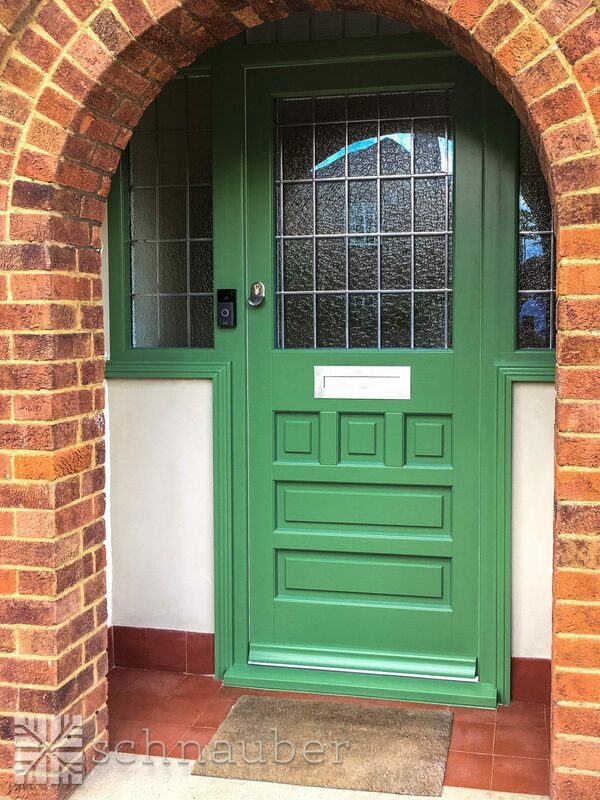 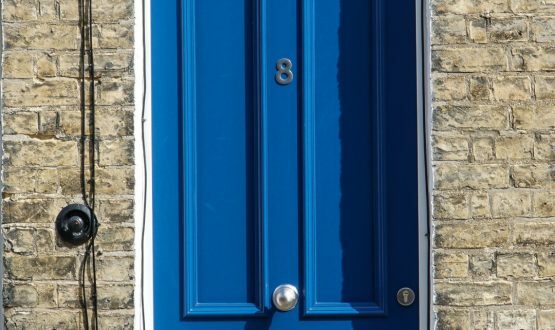 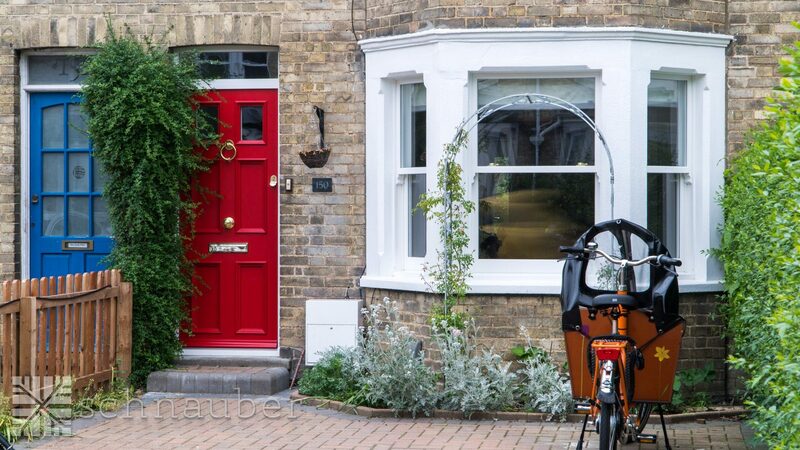 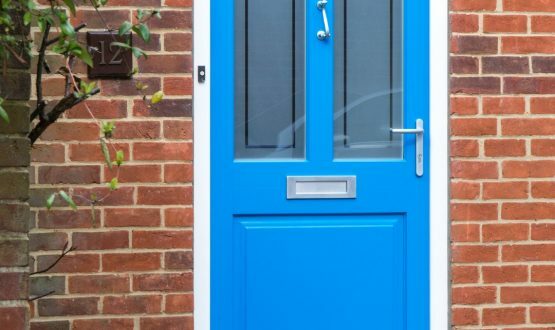 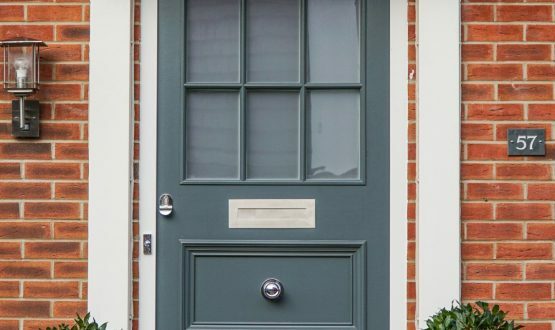 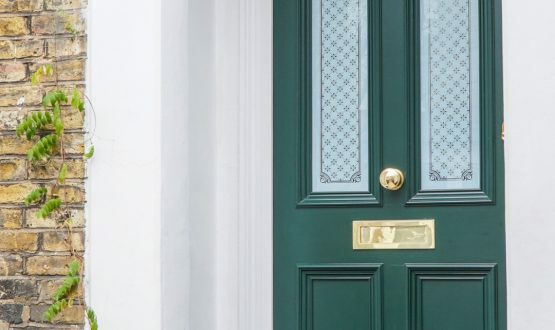 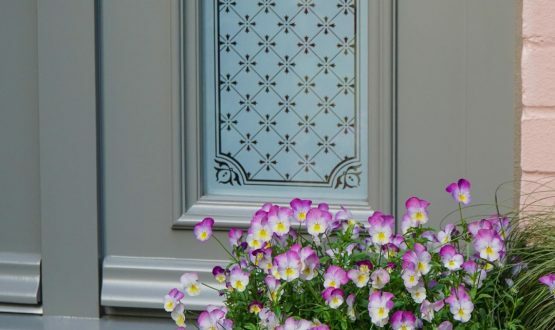 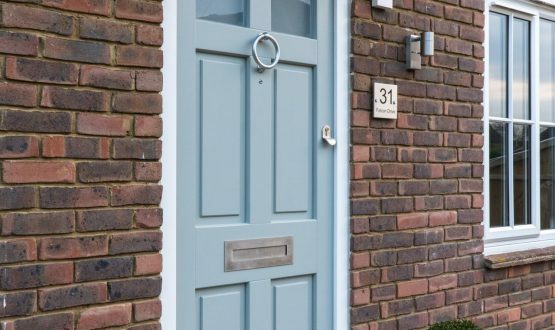 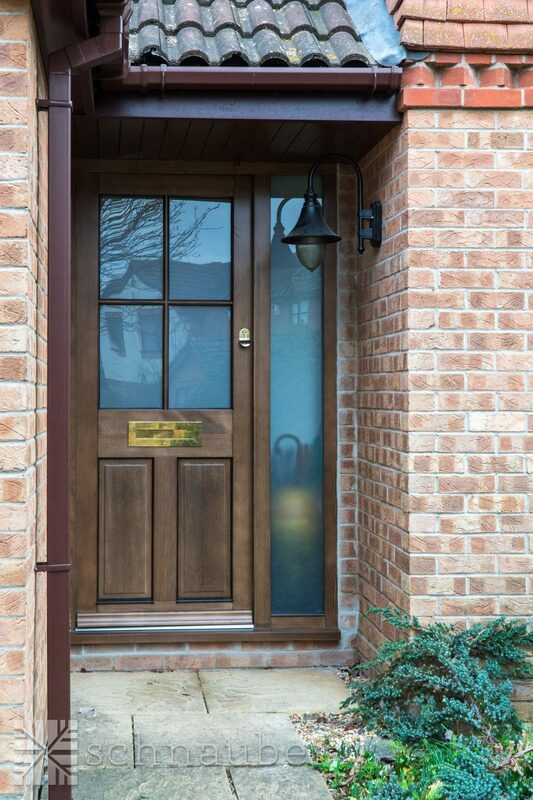 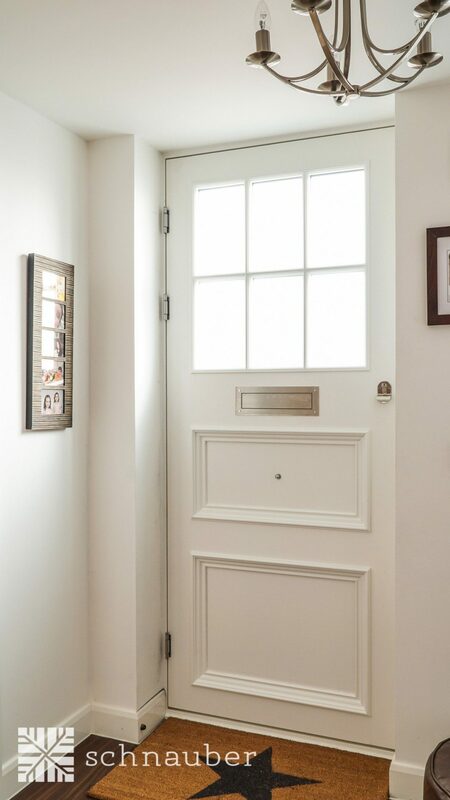 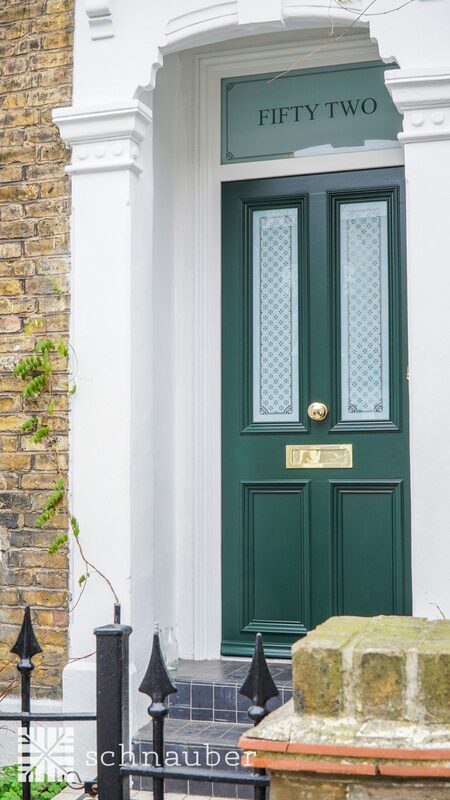 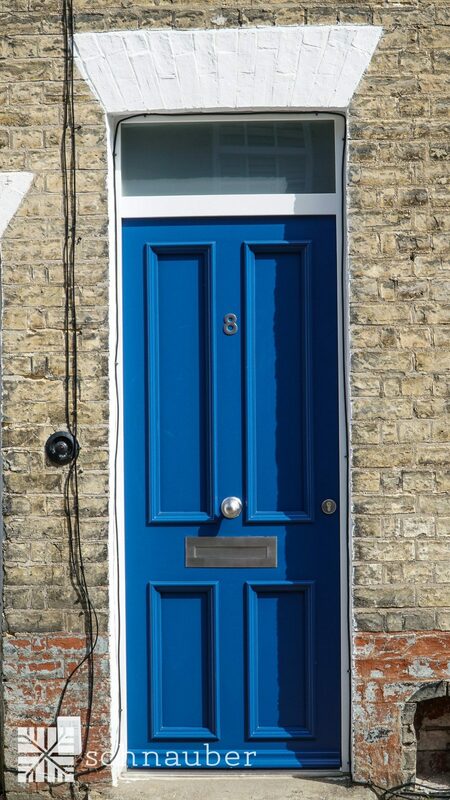 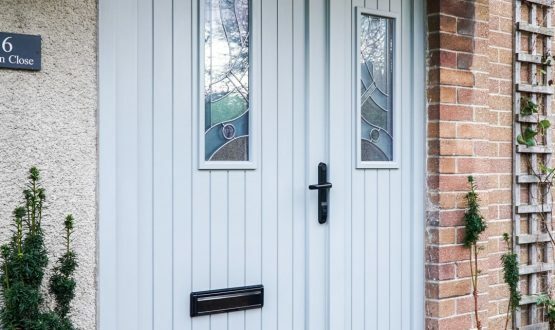 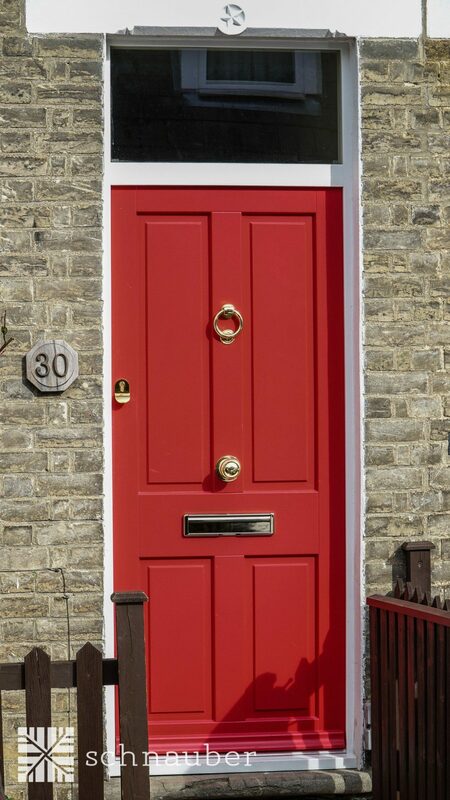 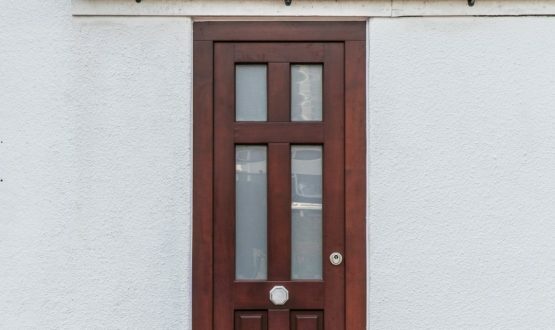 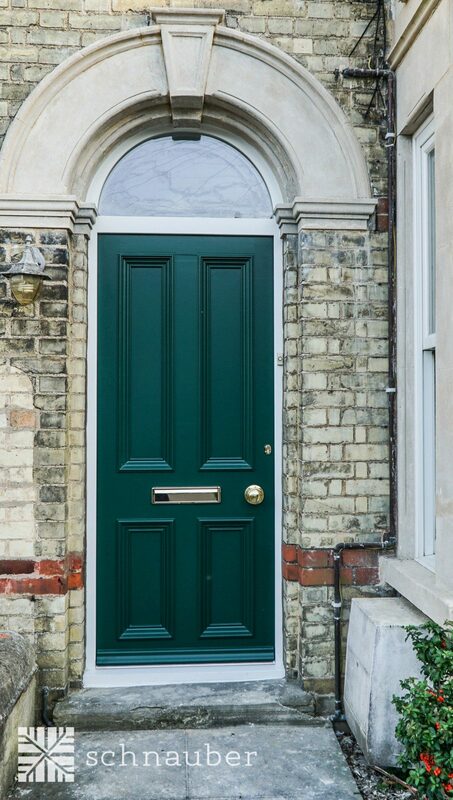 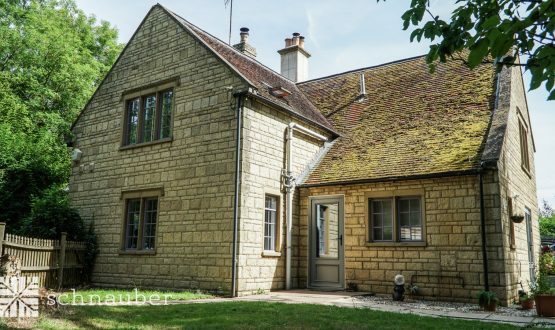 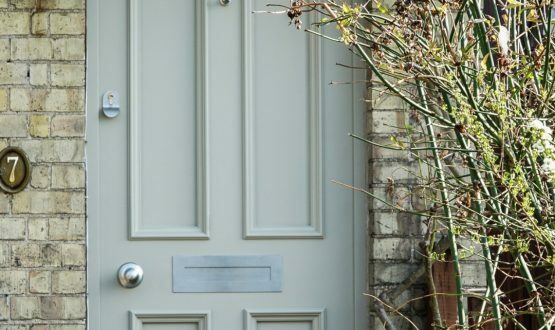 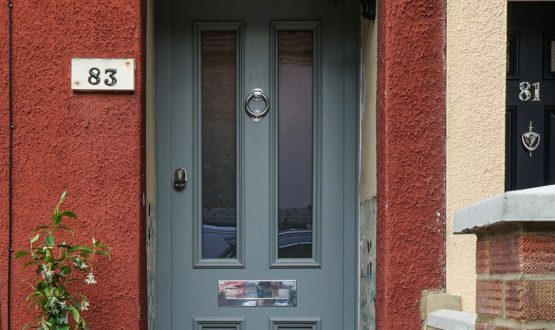 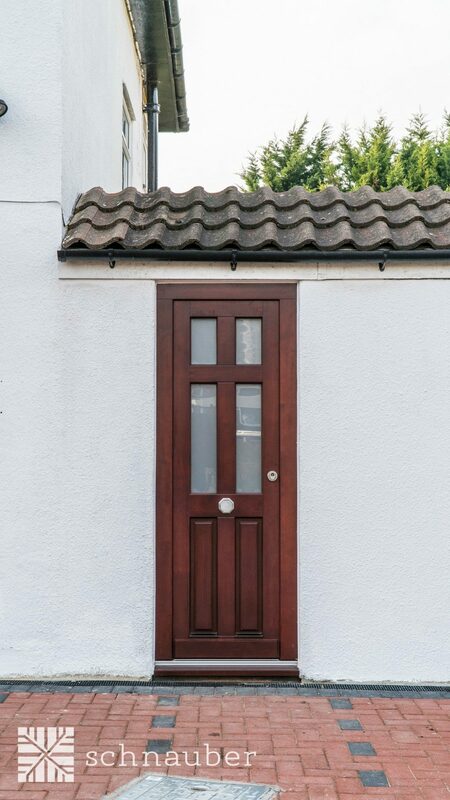 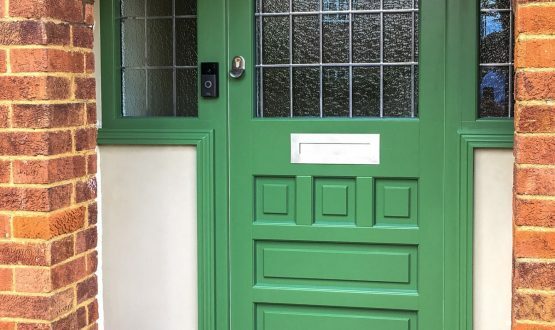 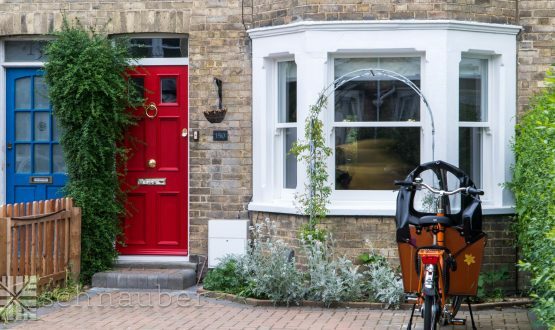 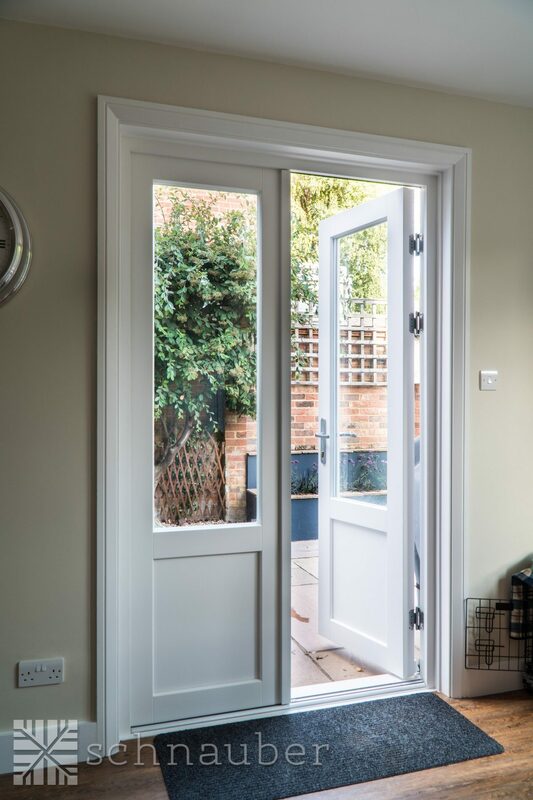 What is a timber French door? 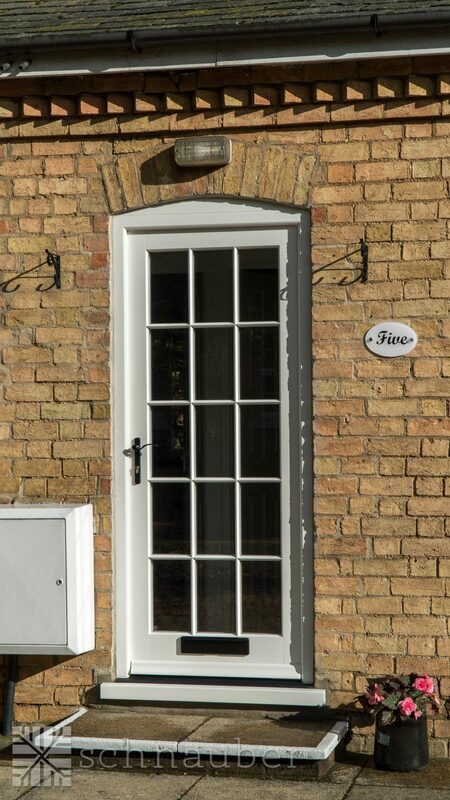 A timber French door is essentially a set of hinged double doors that can either open outwards or inwards to provide access to a space. 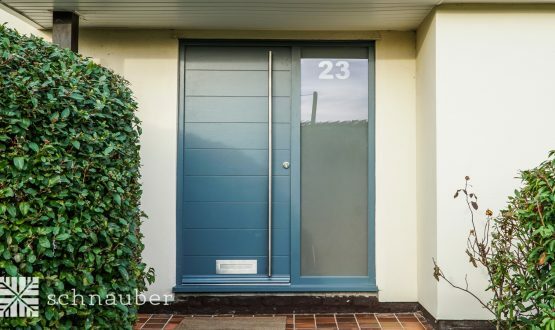 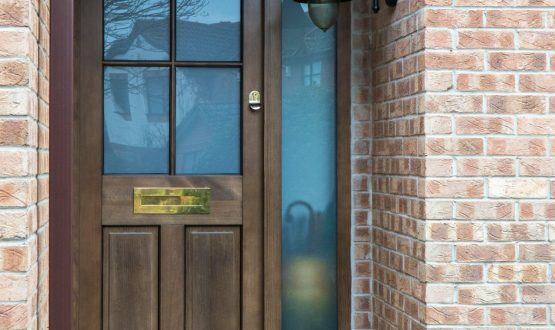 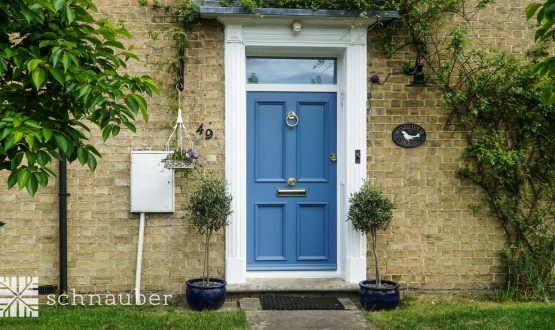 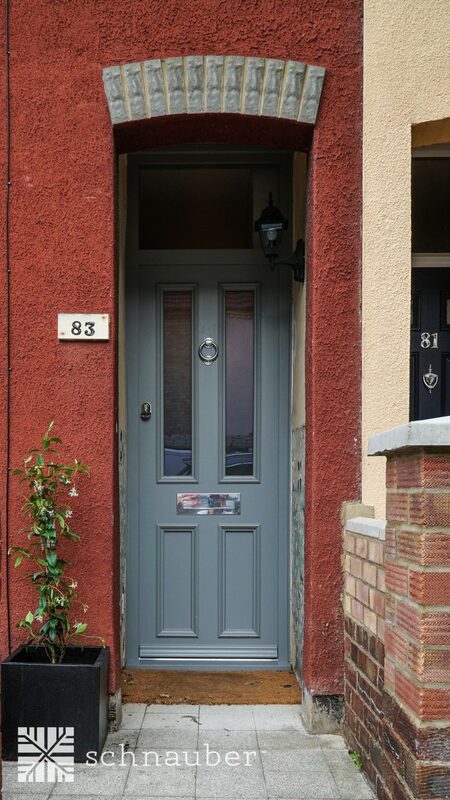 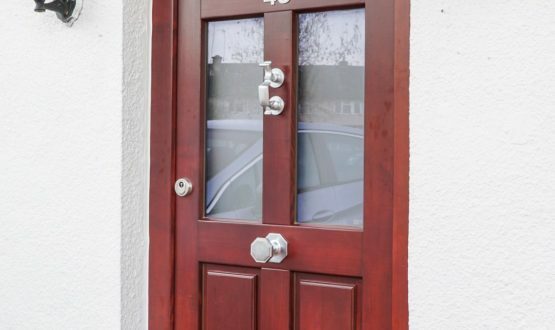 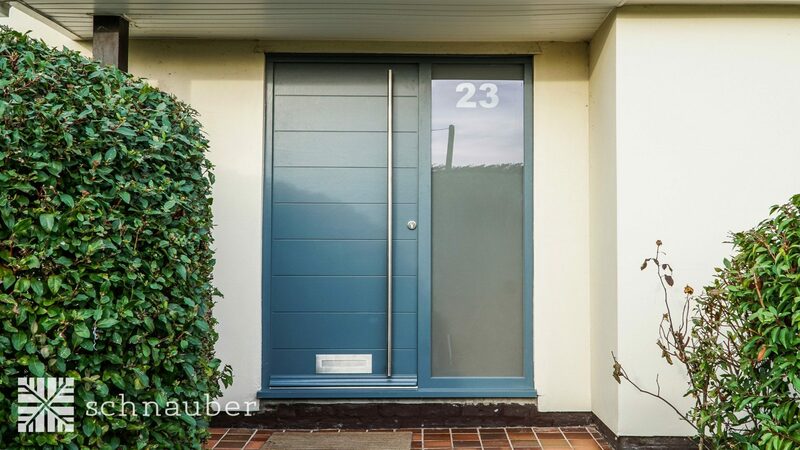 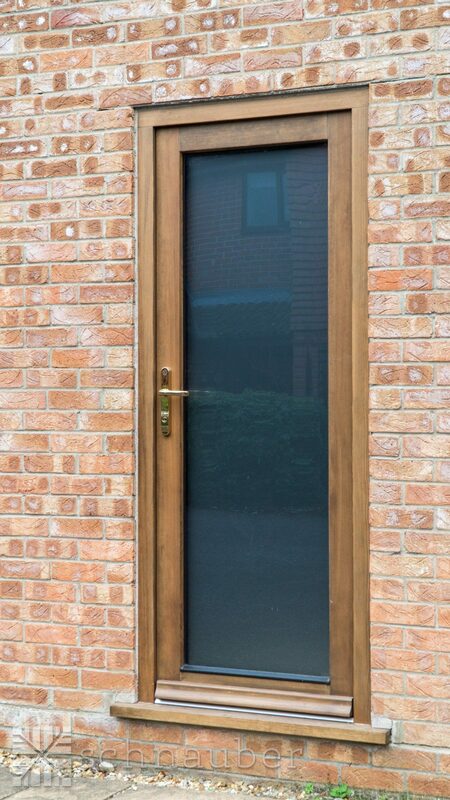 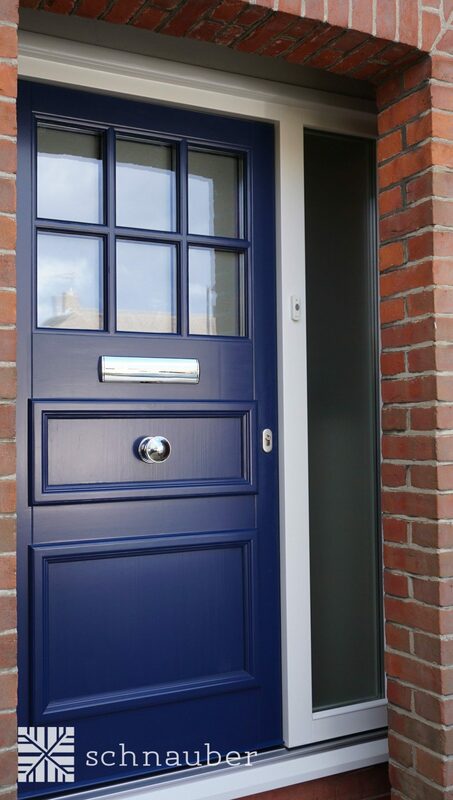 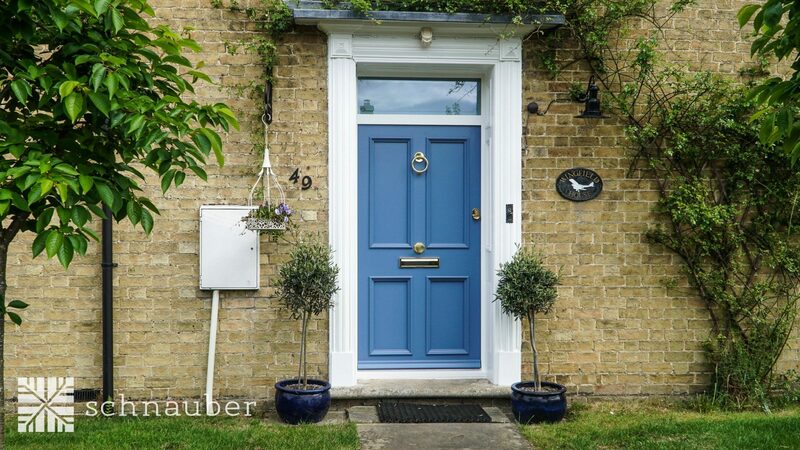 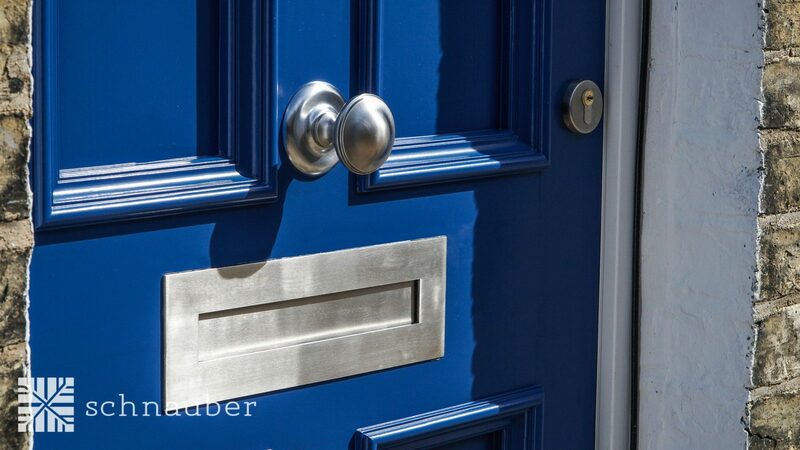 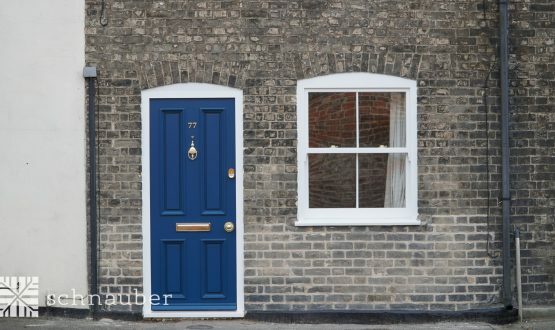 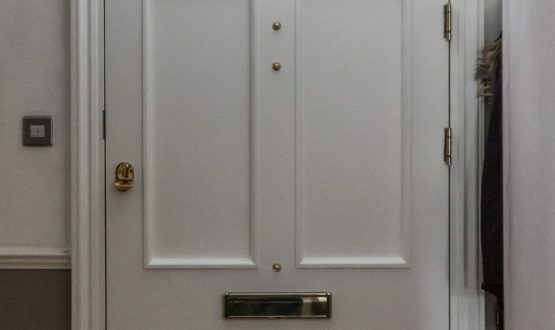 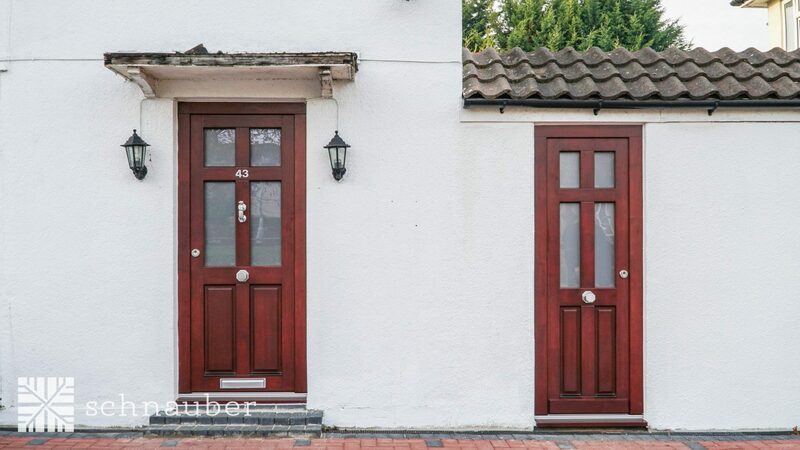 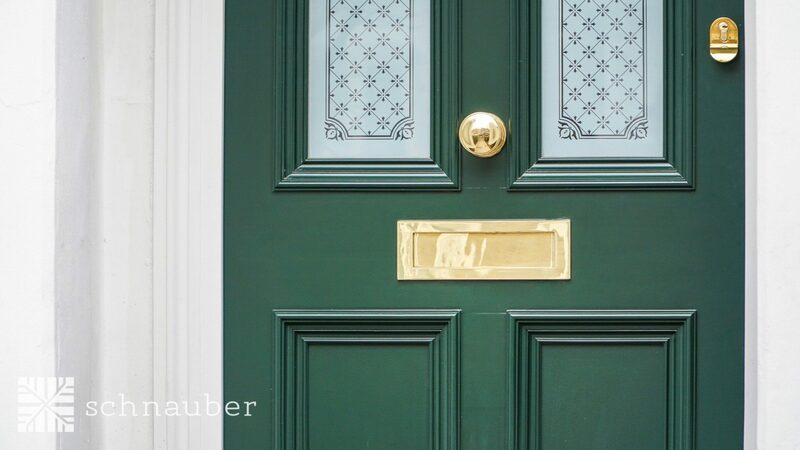 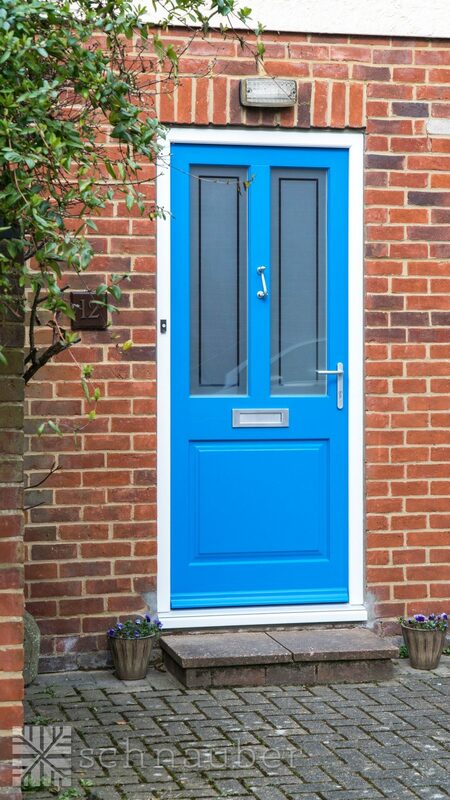 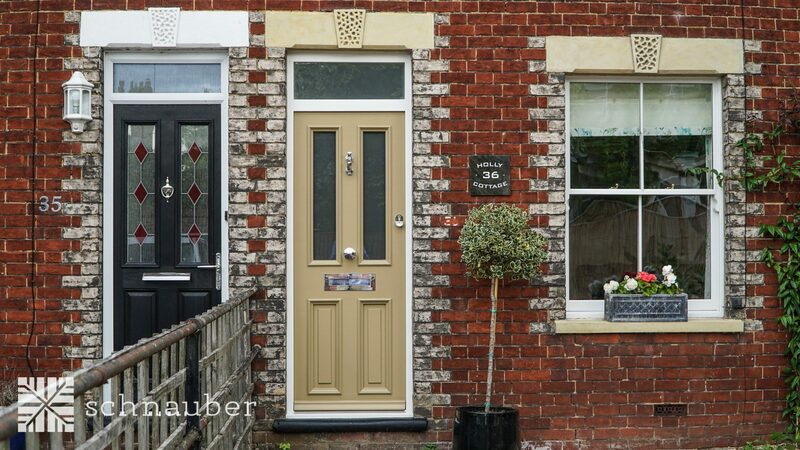 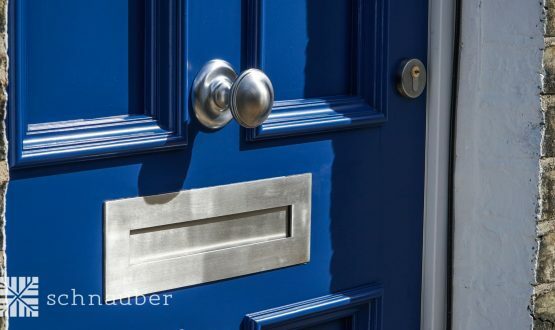 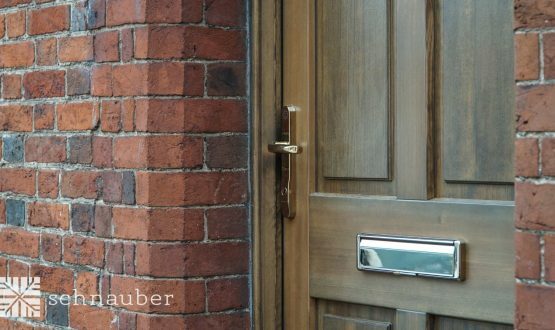 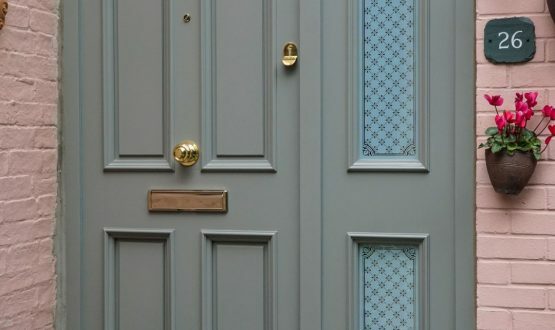 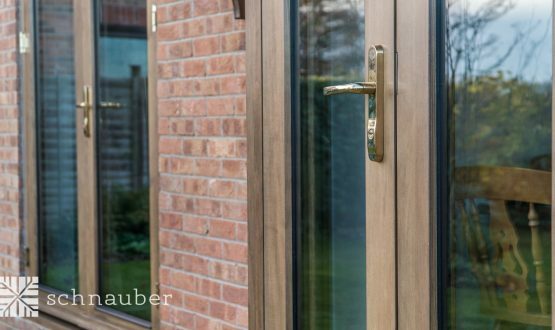 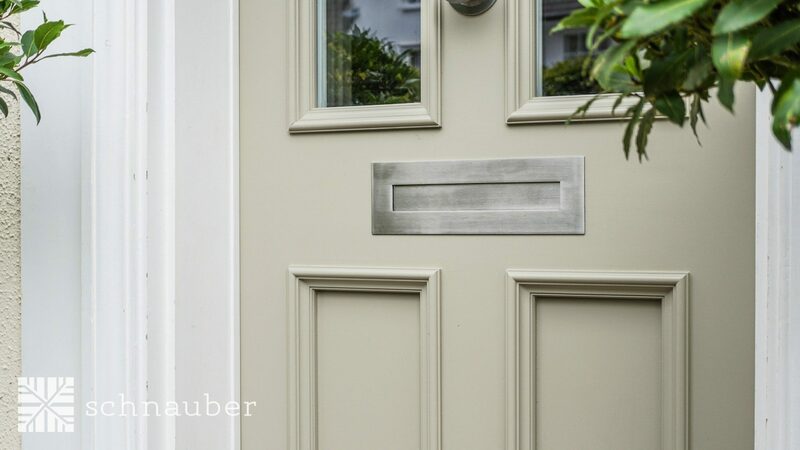 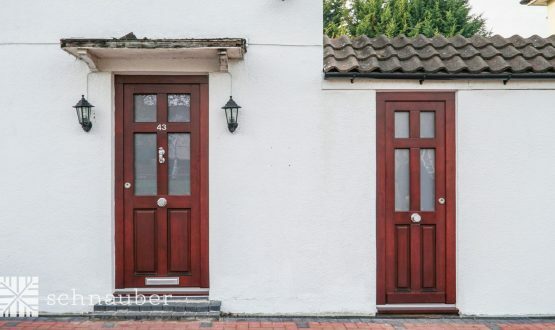 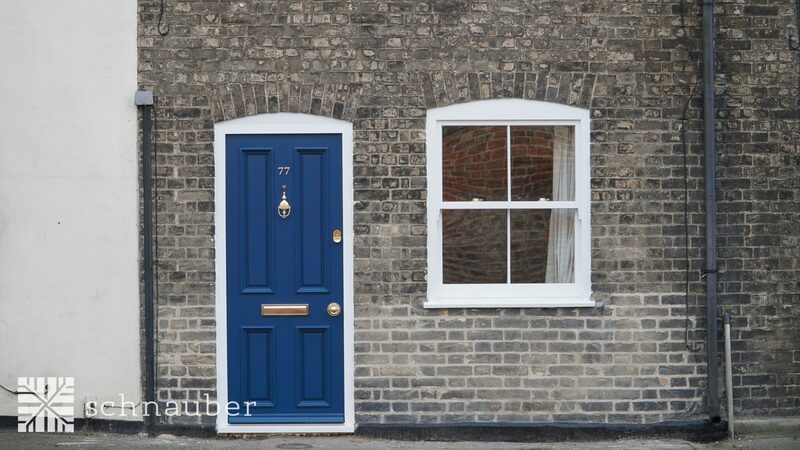 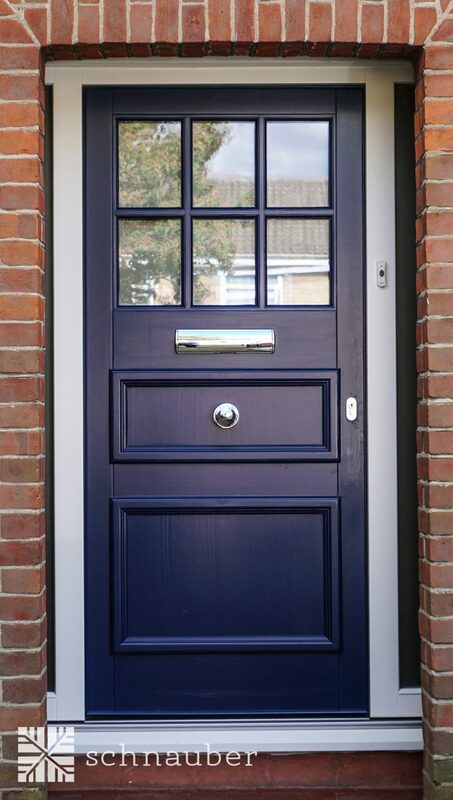 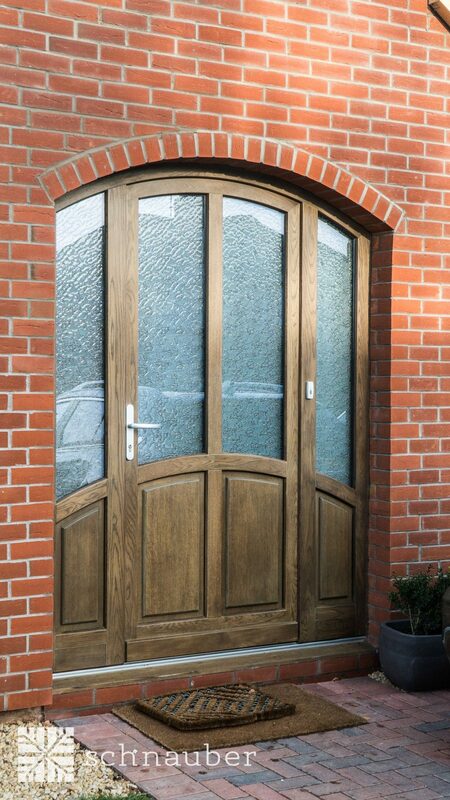 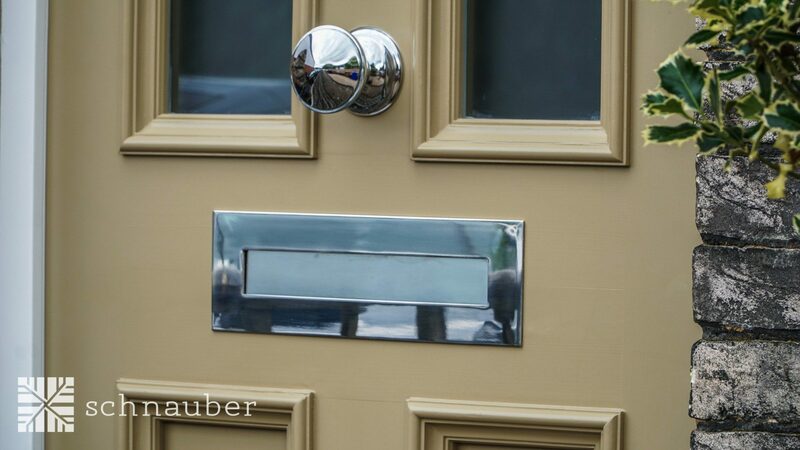 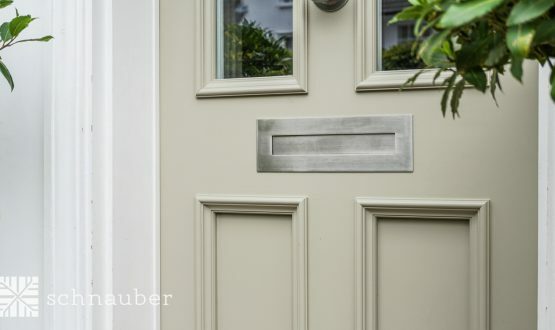 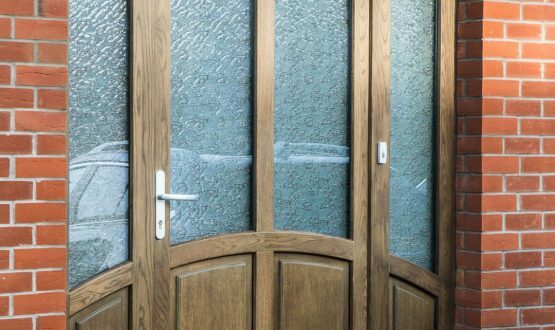 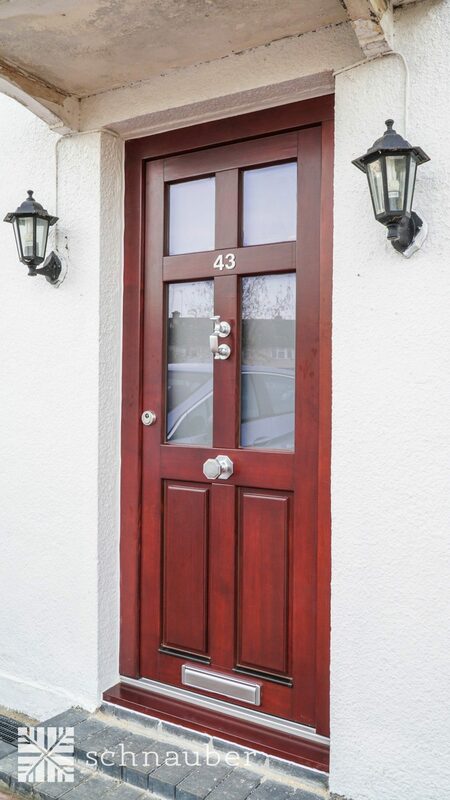 Schnauber offer some of the finest wooden French doors on the market. 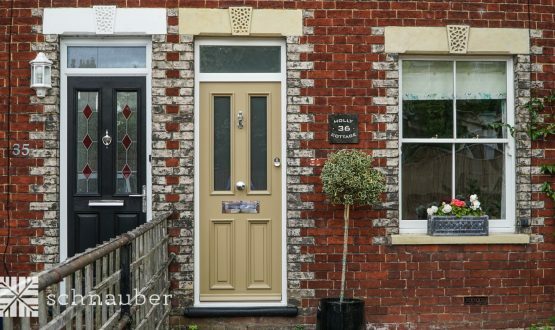 Timber French doors are a beautiful, design classic and can provide a sophisticated feature to traditional styled architecture. 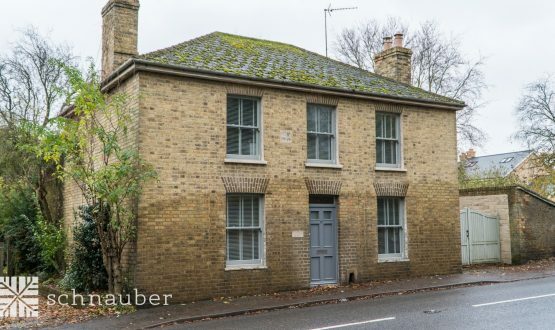 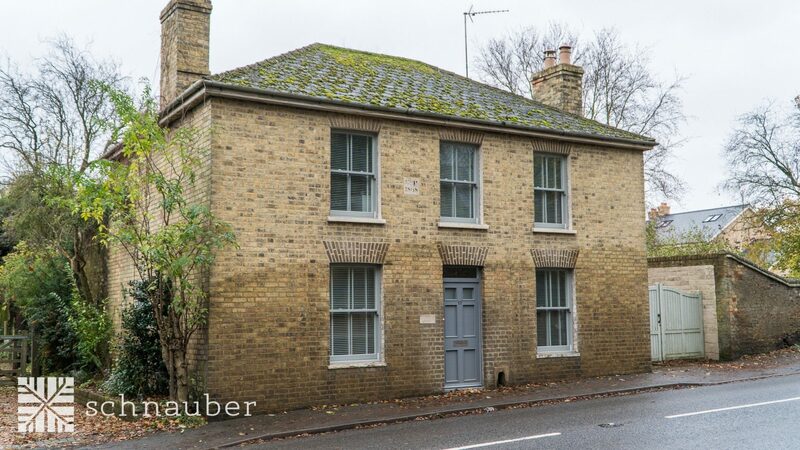 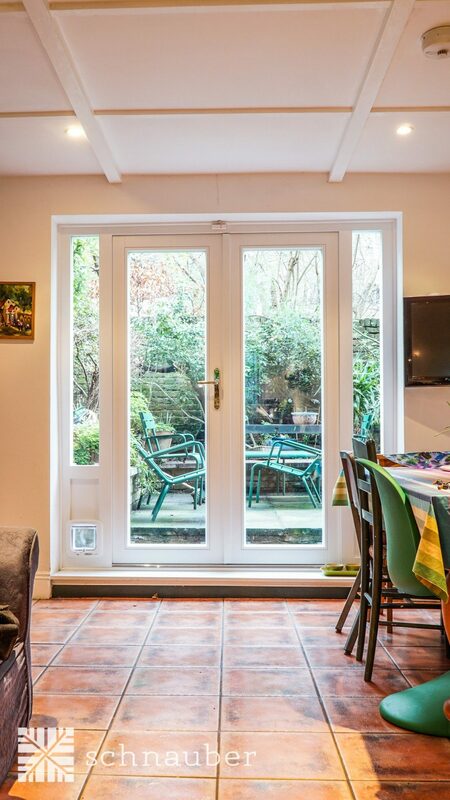 Where would I install French doors? 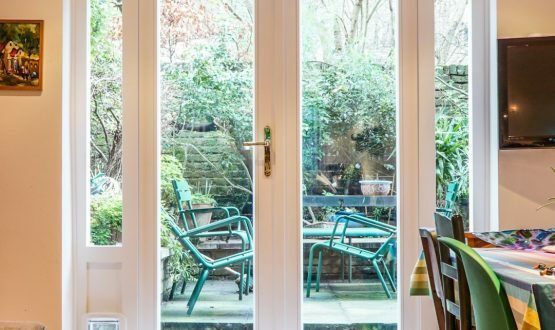 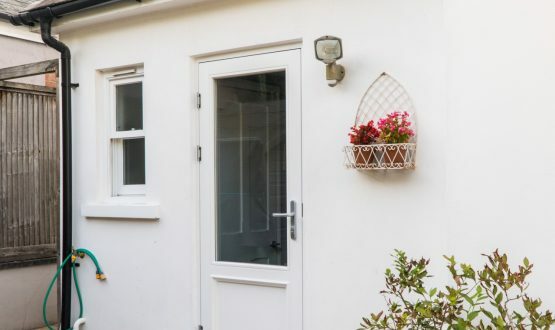 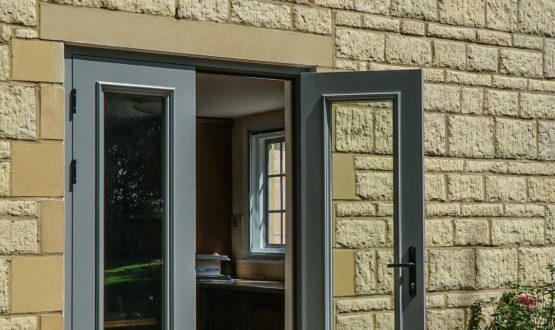 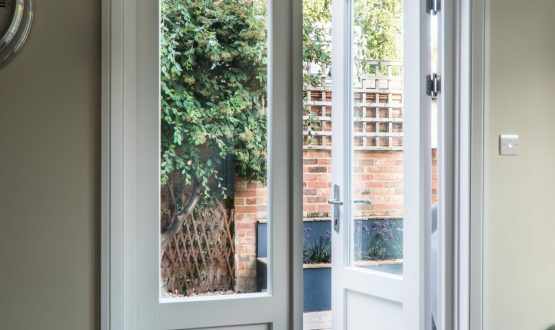 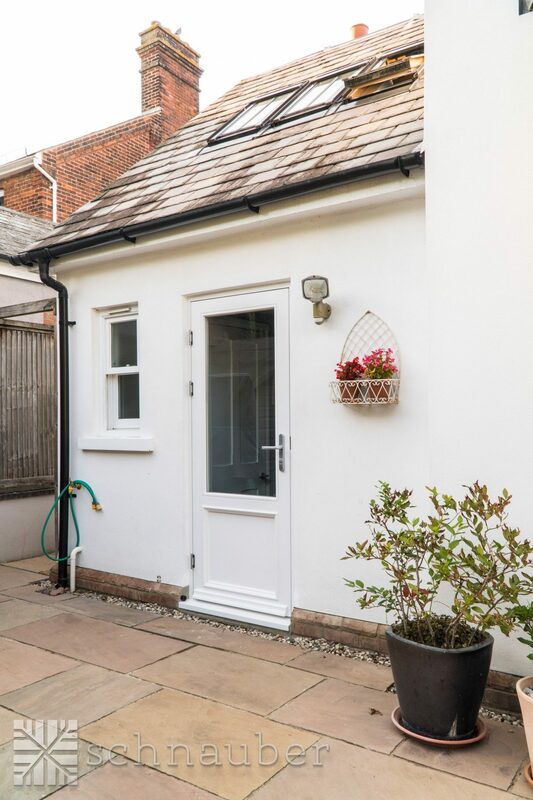 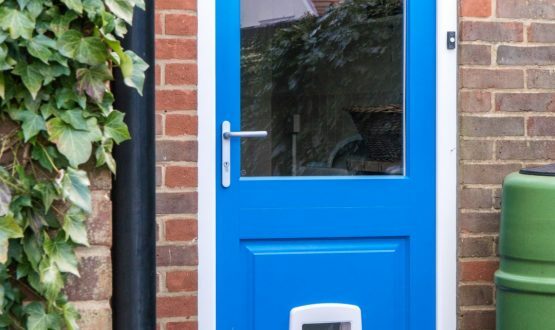 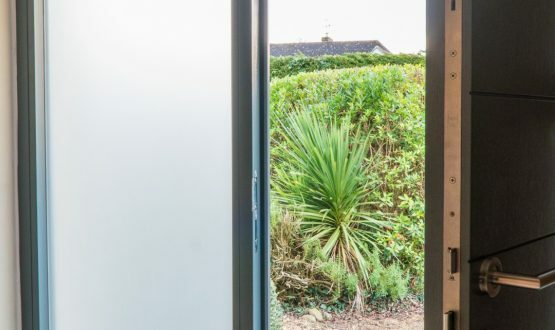 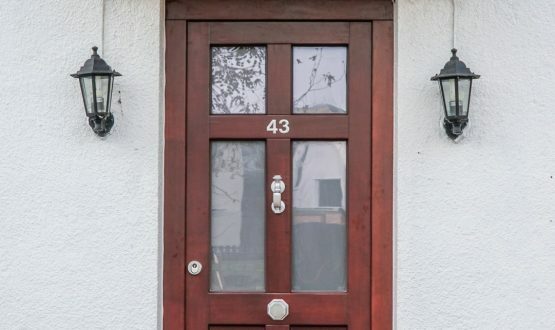 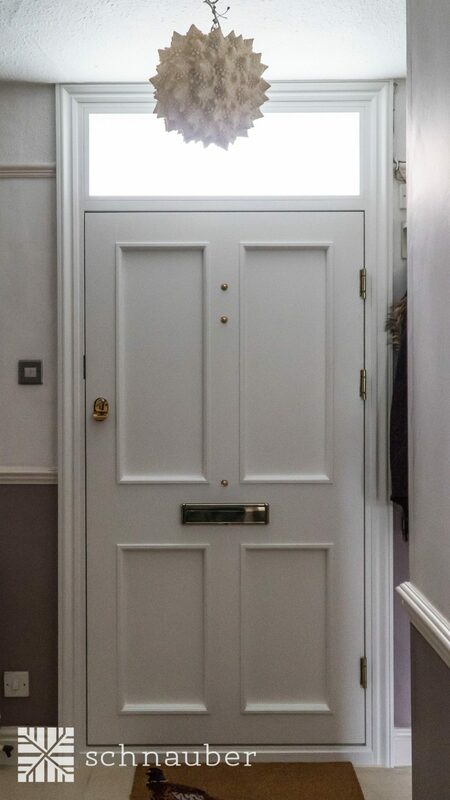 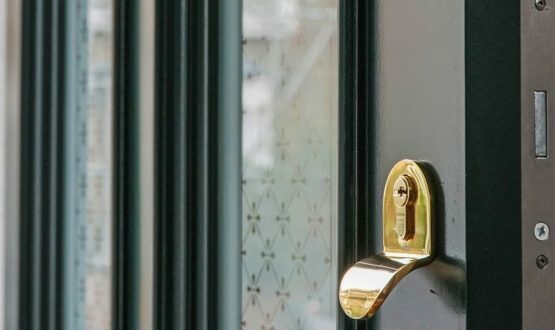 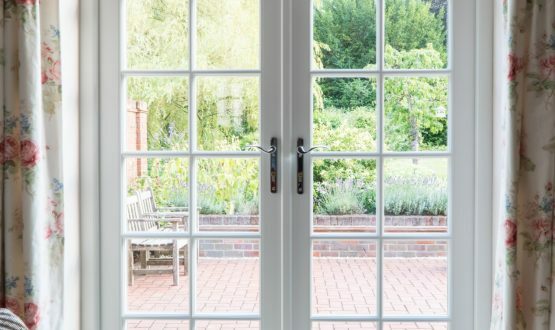 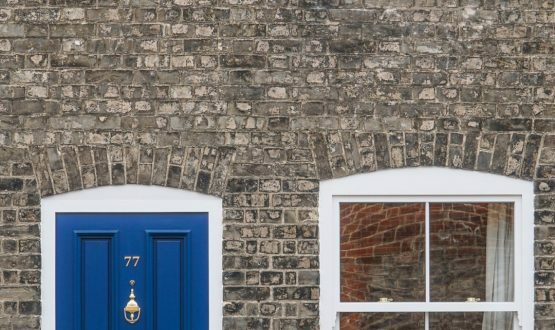 French doors can be used to provide a visual connection and access to an external space, such as decking or a garden, or they can be used internally to separate two areas such as a dining room and lounge or lounge and conservatory. 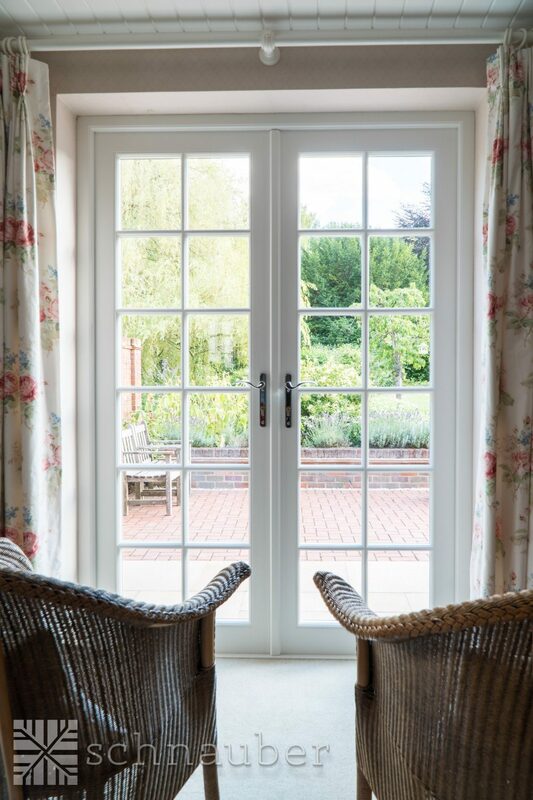 Due to their slender proportions and detailed joinery, French doors allow for great light penetration even when closed. 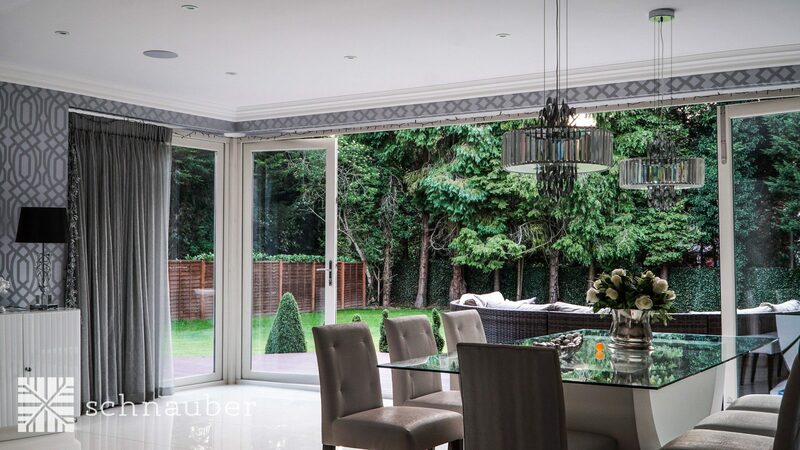 They are appropriate for large or deep rooms or rooms which require great amounts of natural light, such as studios. 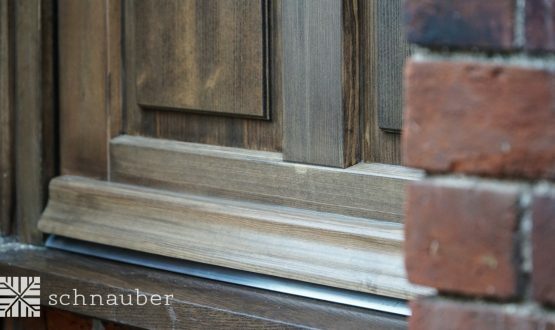 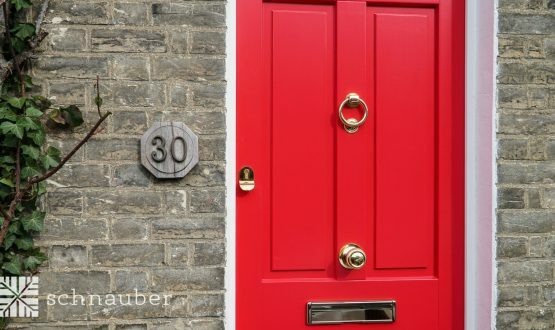 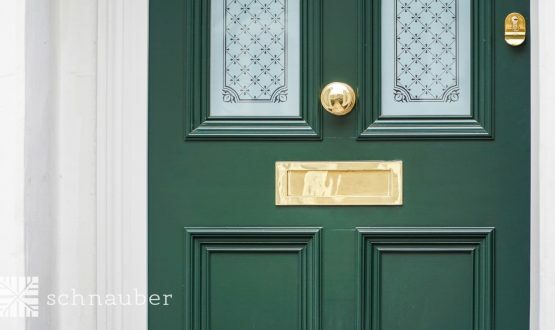 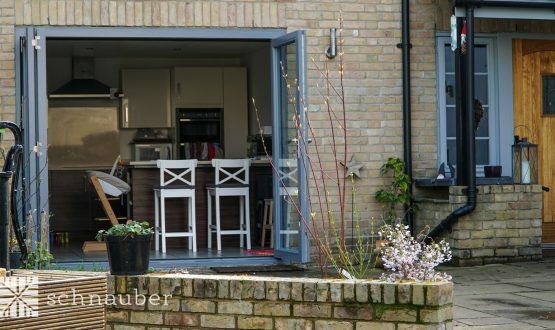 Why would I choose a Schnauber timber French door? 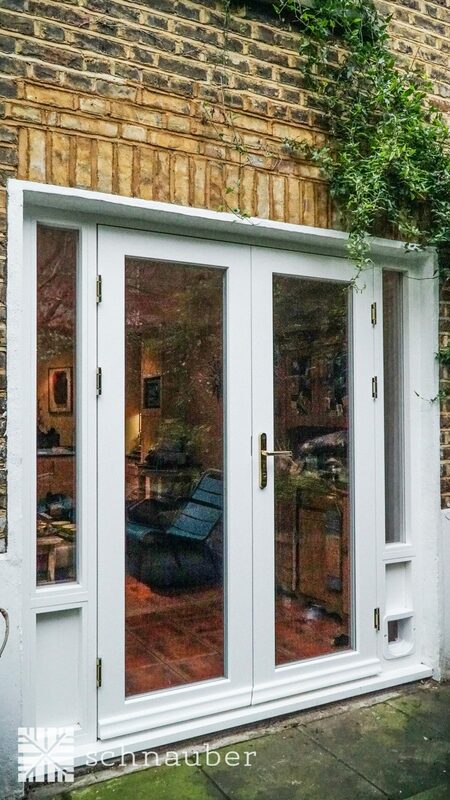 If you would like to make an external space part of the internal space French doors are very effective. 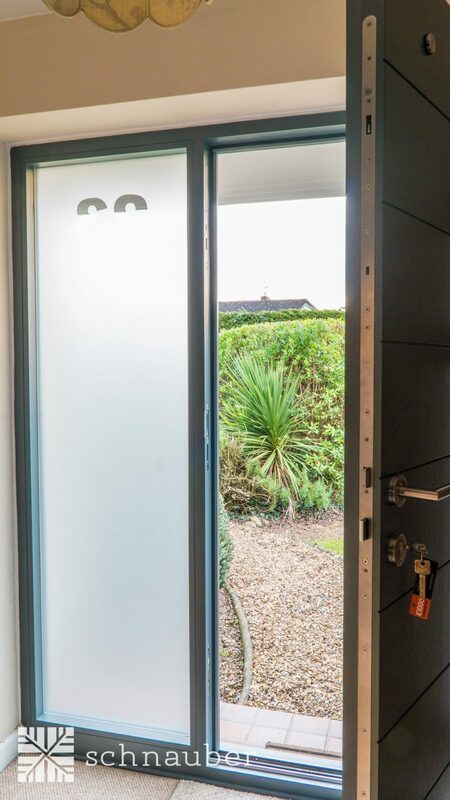 If you are looking to provide easy access to another internal space whilst retaining a degree of privacy French doors are ideal. 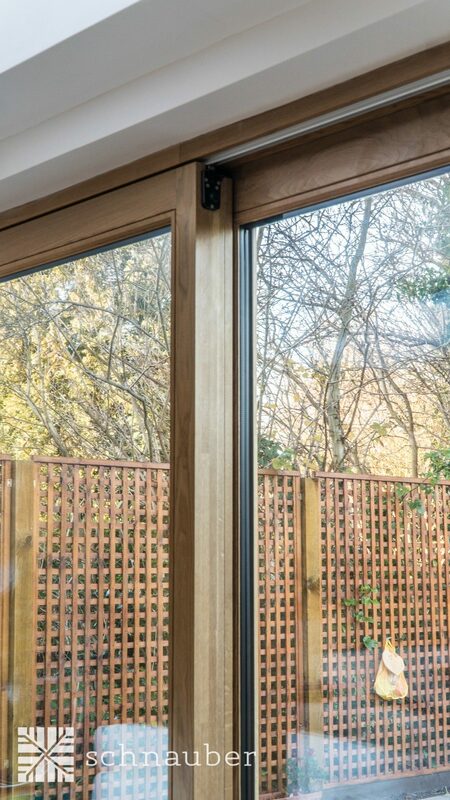 If you want to increase the level of natural light and ventilation in a room. 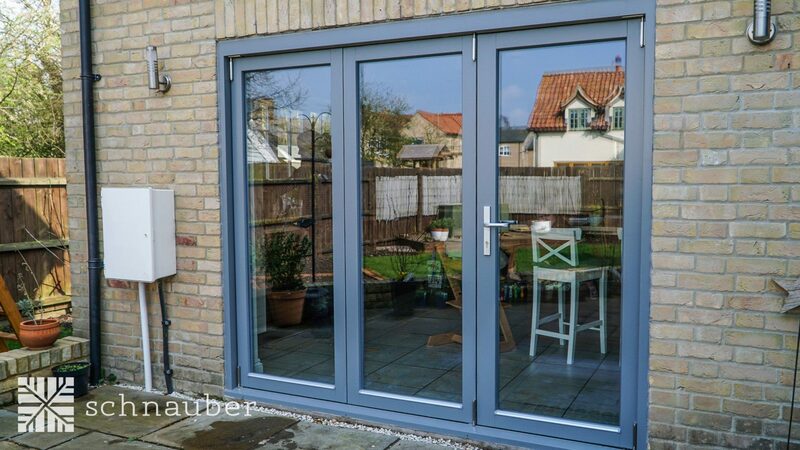 Schnauber French doors are supplied with double glazing with toughened glass units fitted as standard. 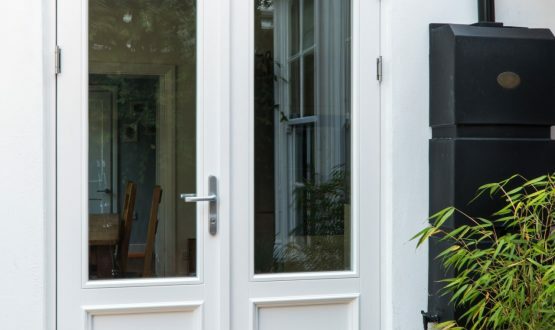 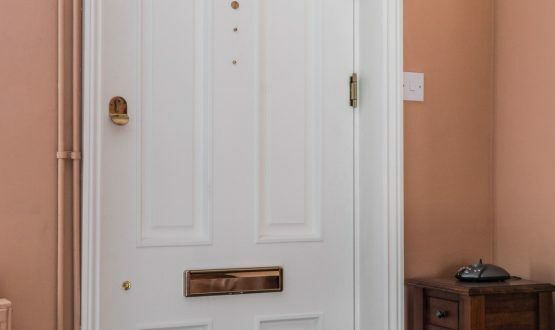 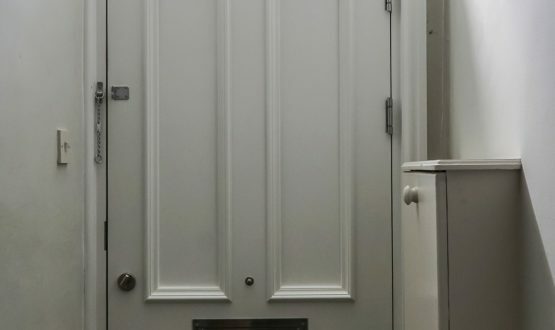 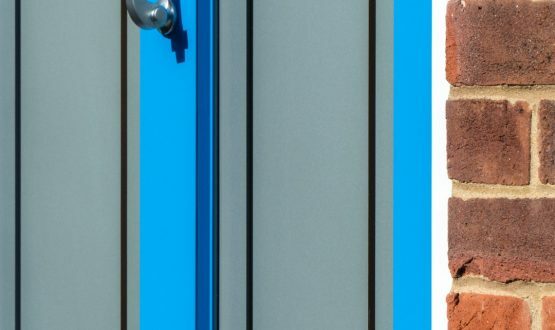 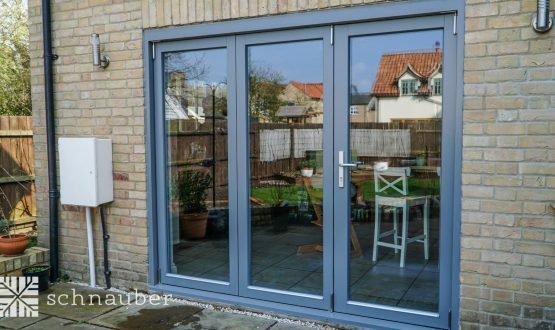 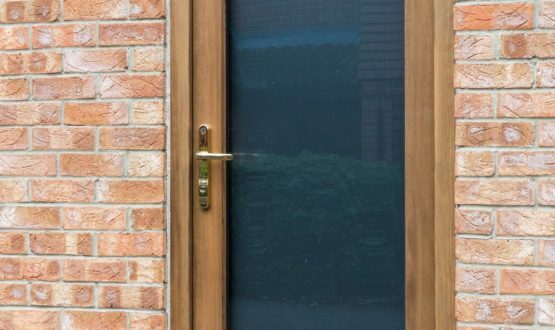 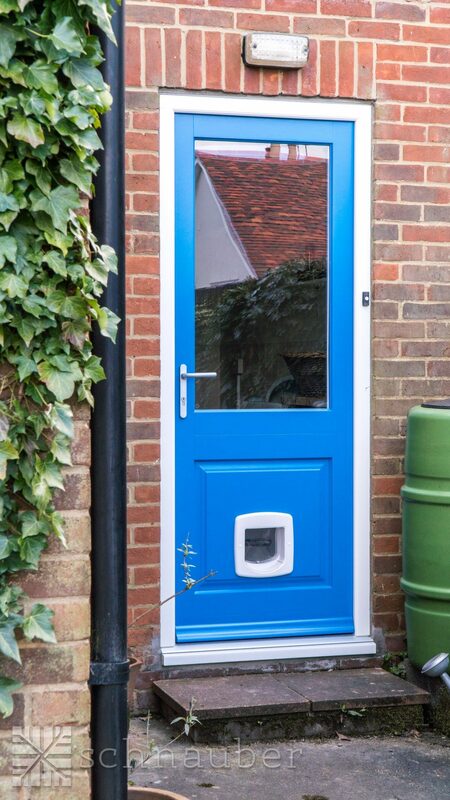 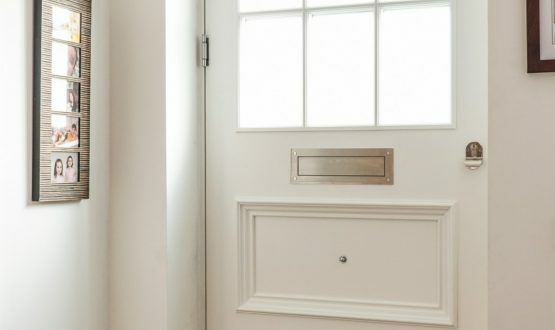 If you are looking for high levels of security the French doors manufactured by Schnauber are fitted with an integrated multi point locking system. 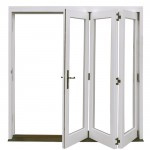 They are also PAS24 tested, offering a higher security performance. 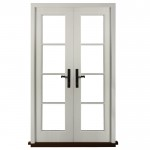 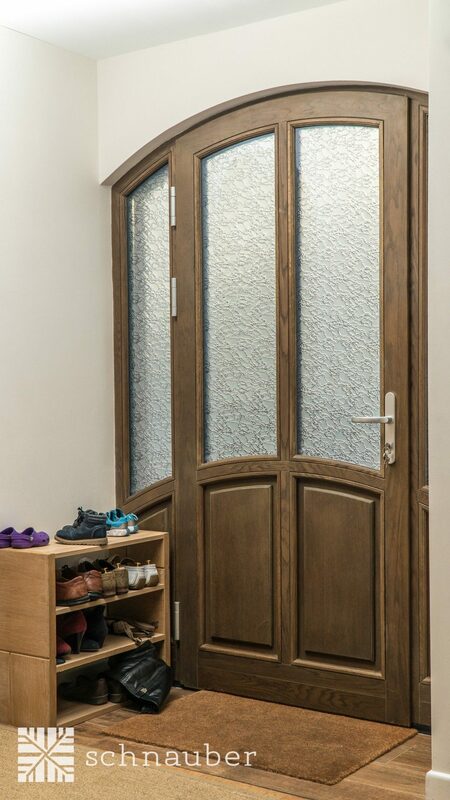 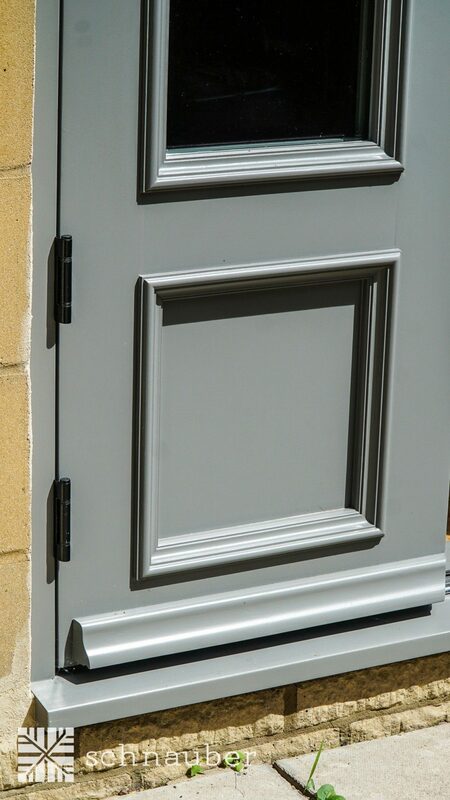 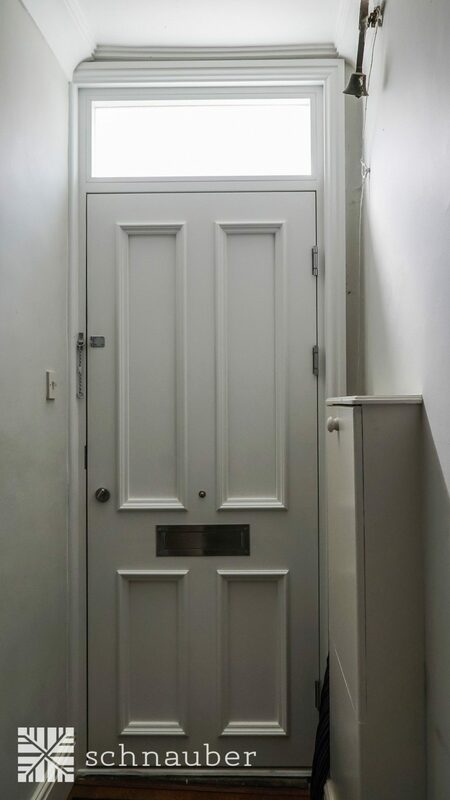 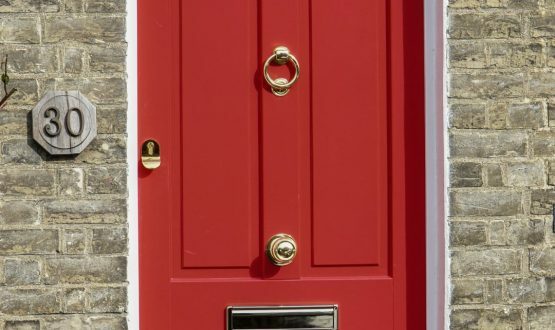 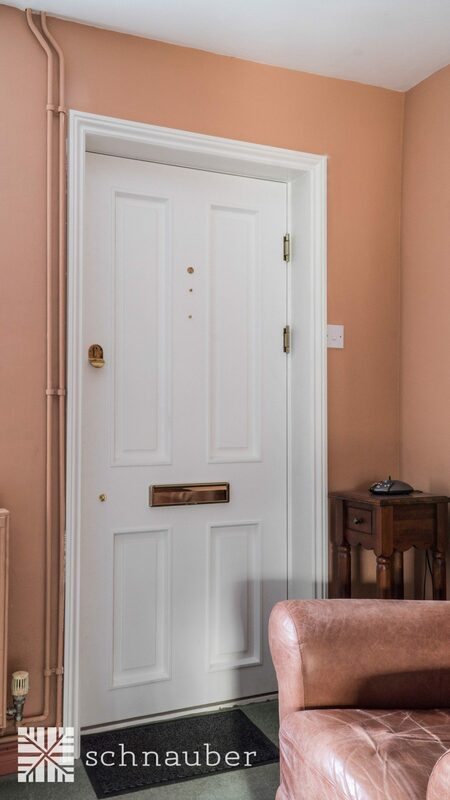 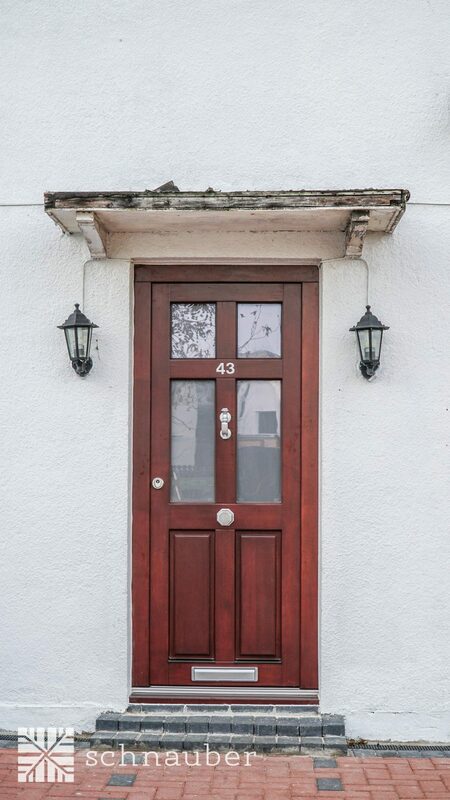 What options are available for my wooden French door? 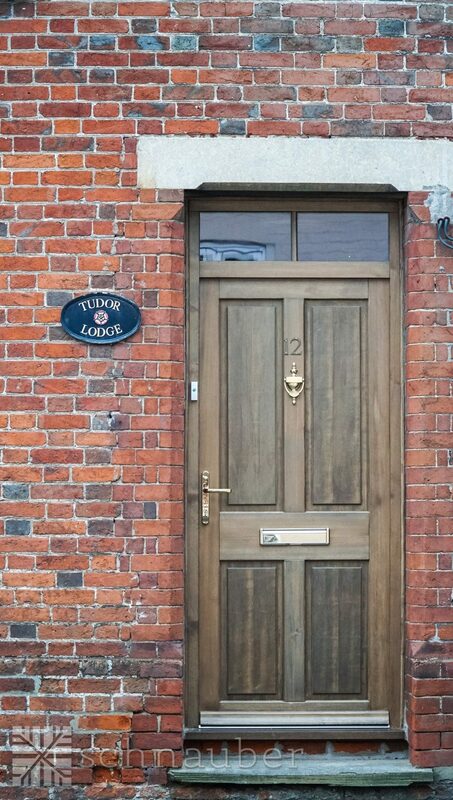 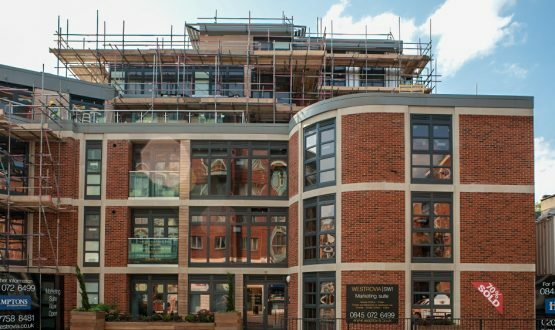 Choice of variety engineered timber species to meet your requirements. 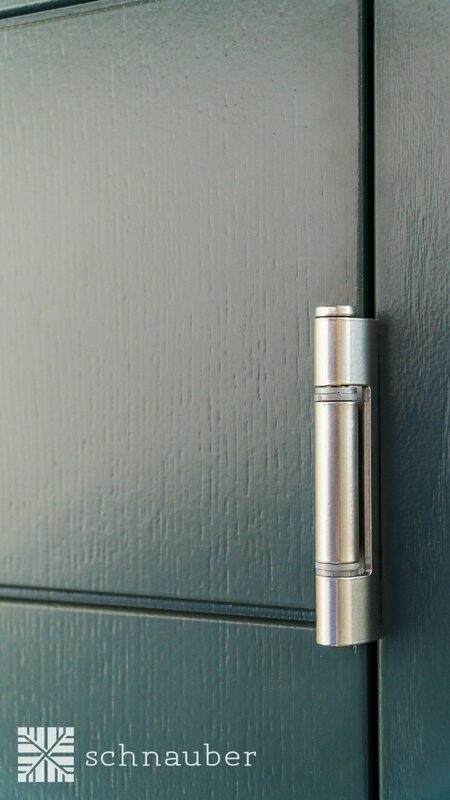 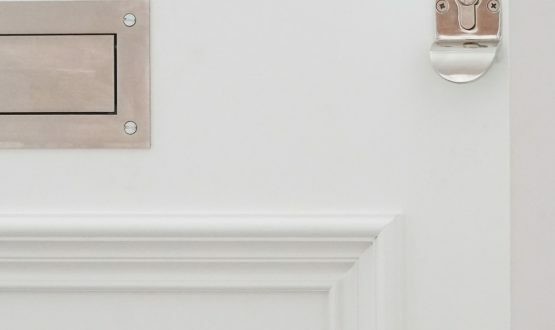 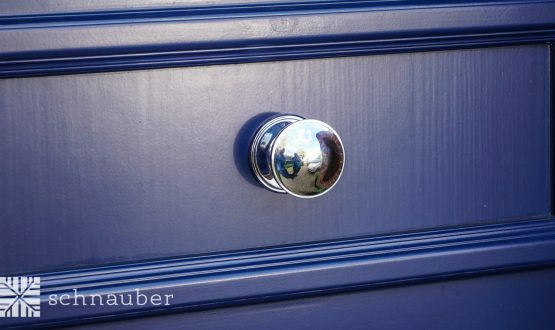 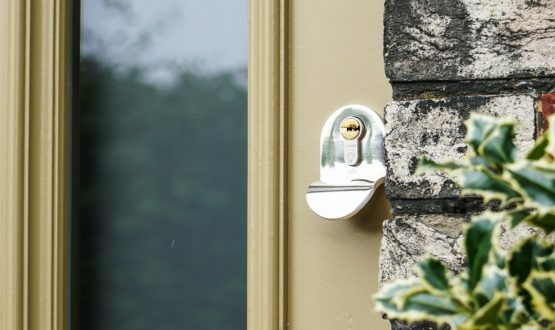 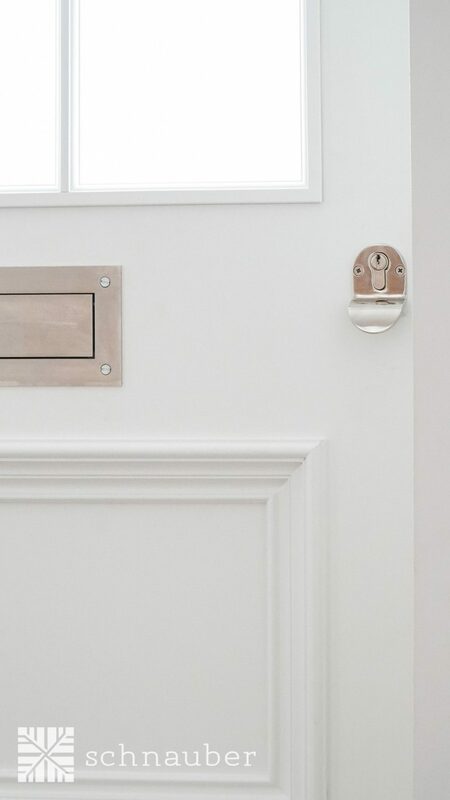 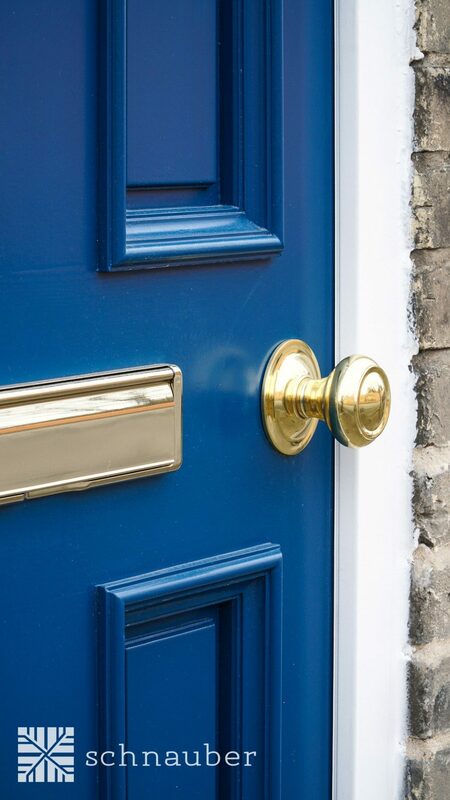 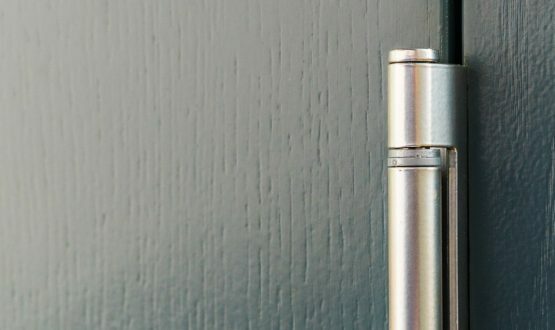 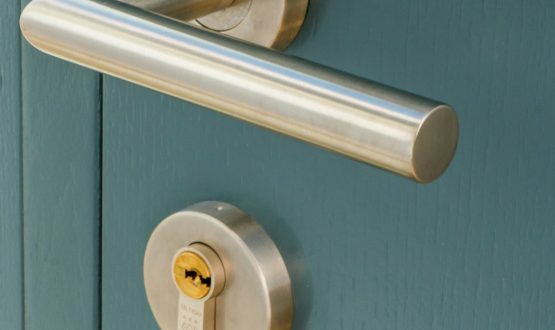 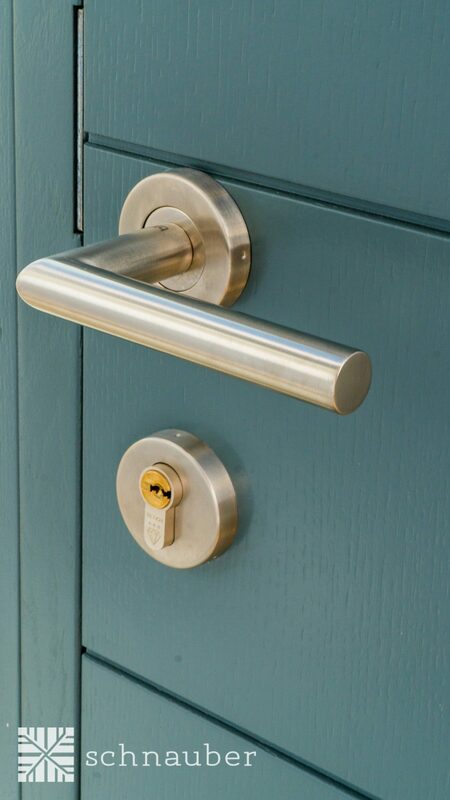 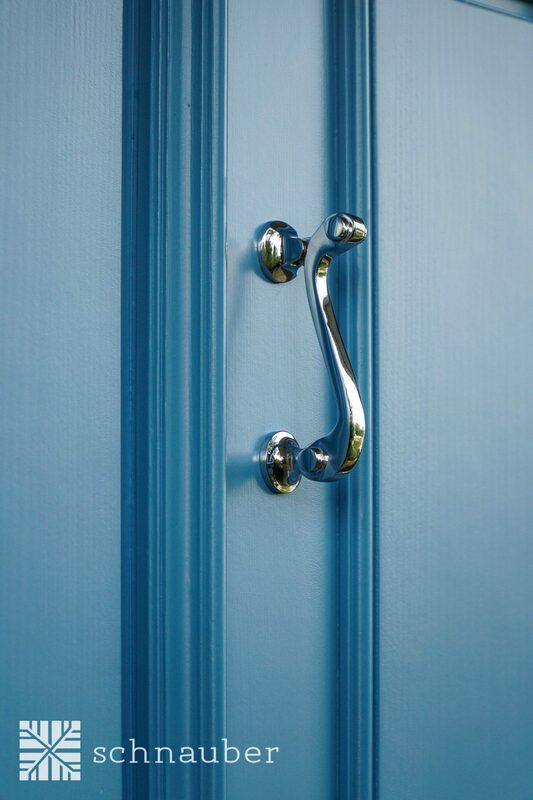 Wide selection of ironmongery including hinges, bolts, handles and fittings. 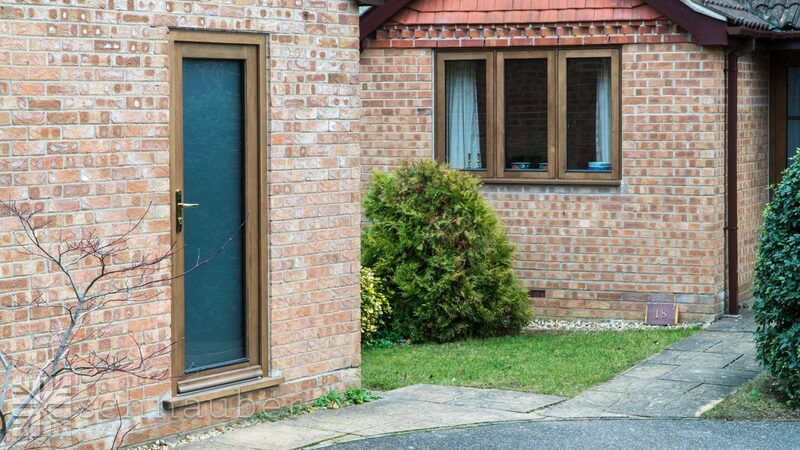 Toughened glass as standard with double or triple glazing. 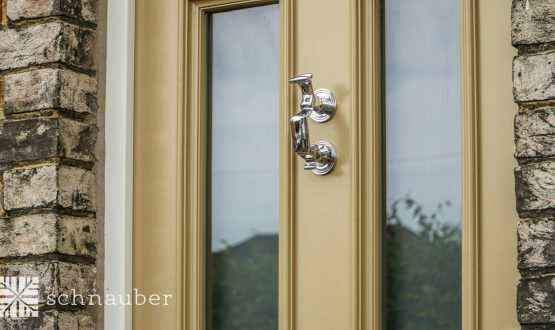 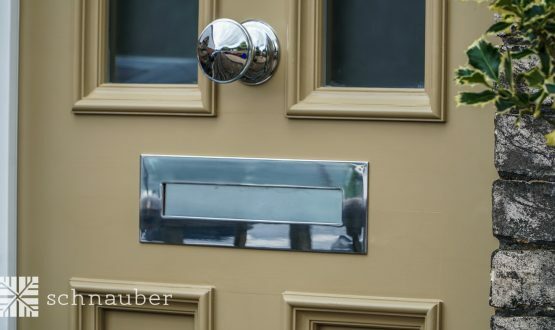 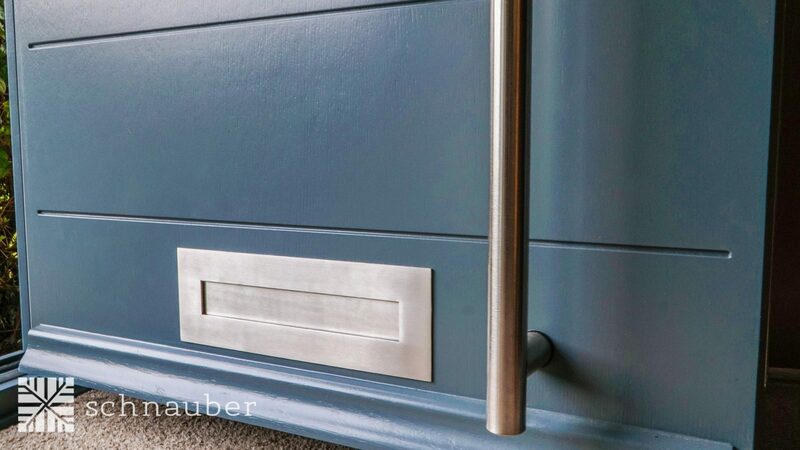 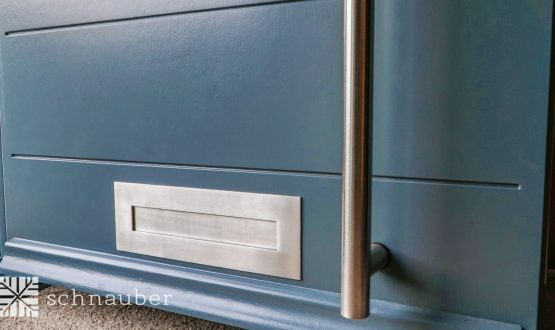 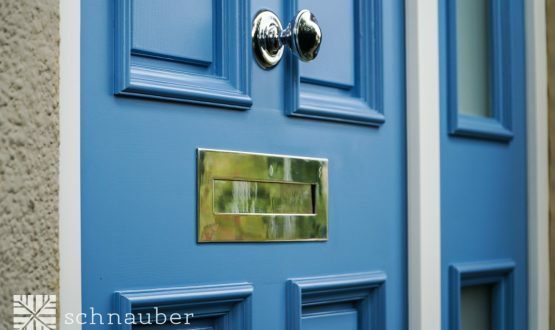 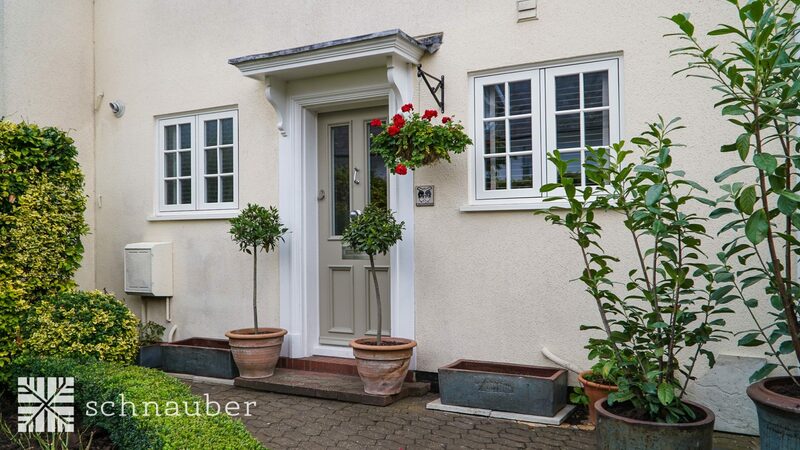 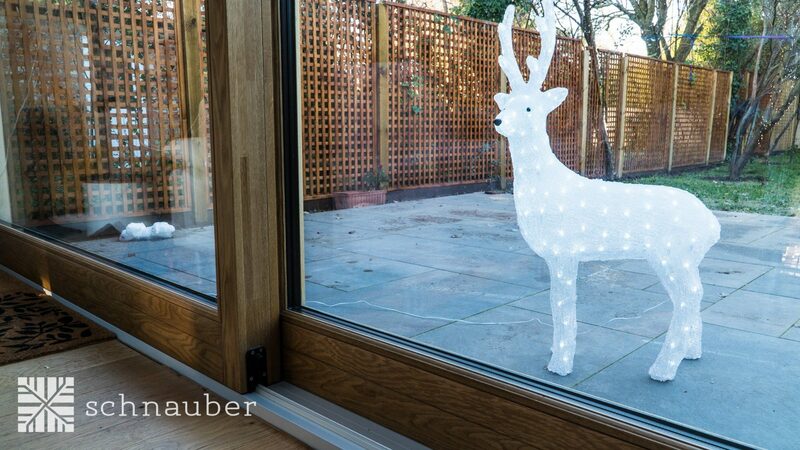 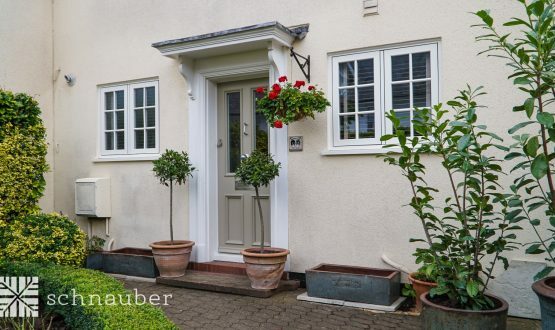 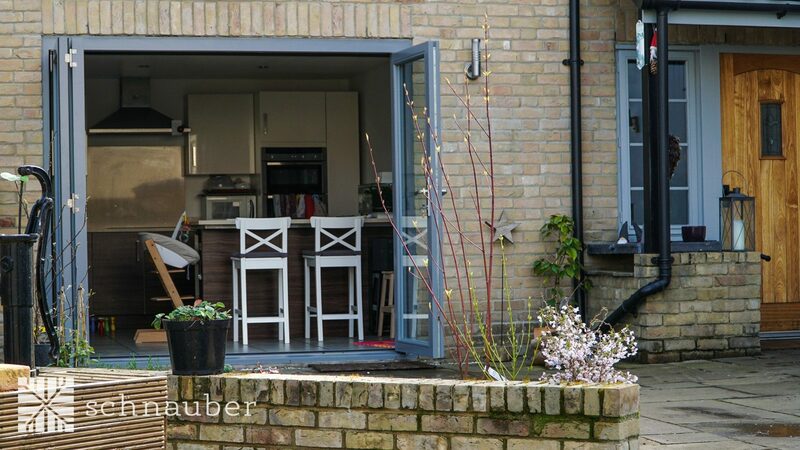 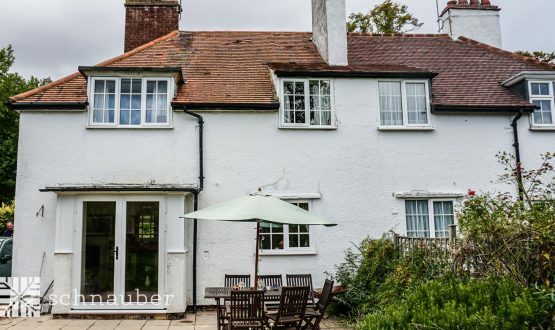 Are Schnauber’s timber French doors environmentally friendly? 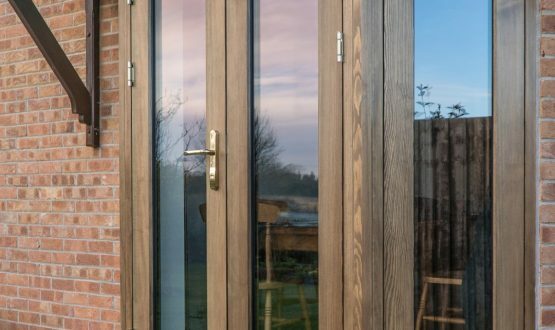 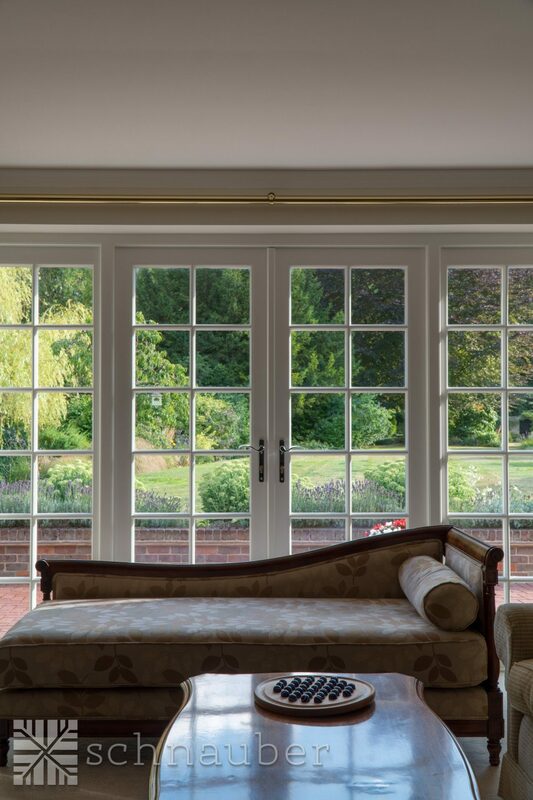 All of our wooden French doors are manufactured from responsible and sustainable sources and certified by the Forest Stewardship Council (FSC). 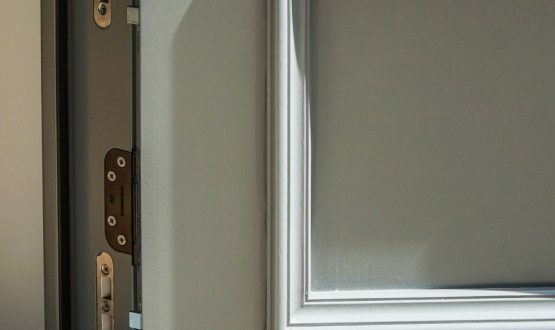 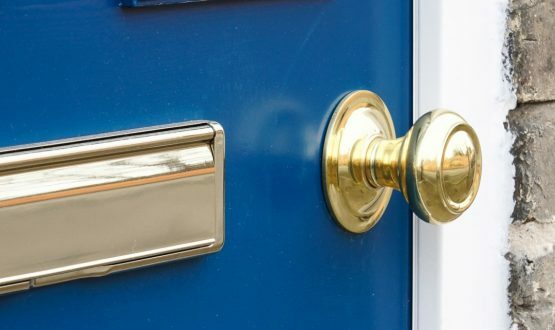 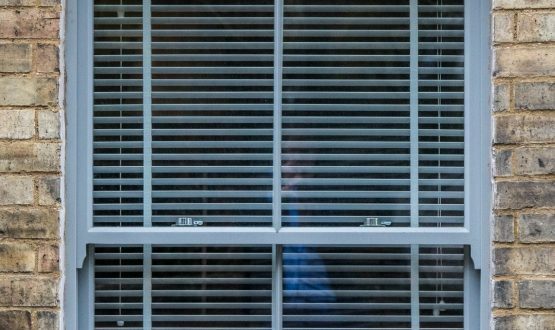 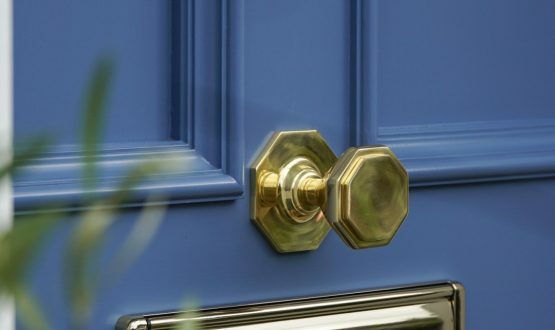 How long will it take to install a new wood French door? 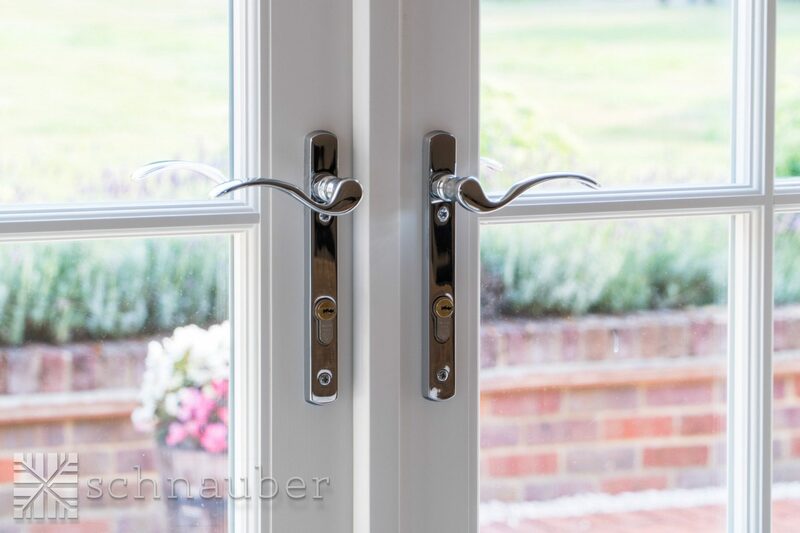 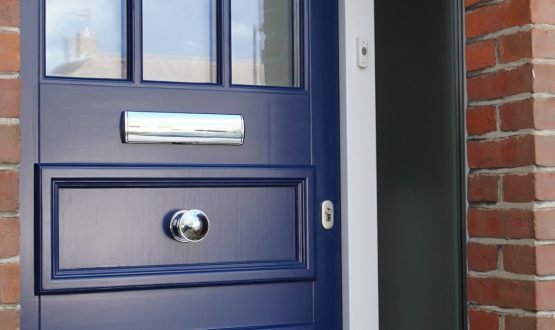 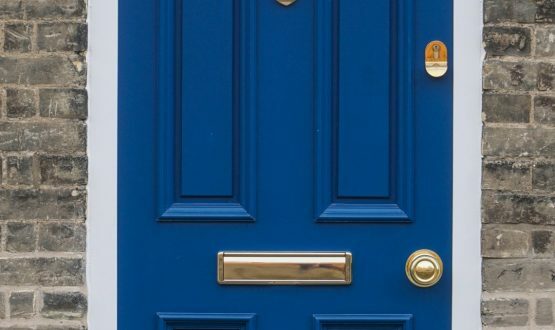 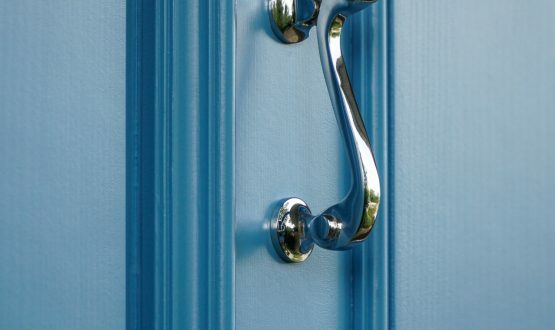 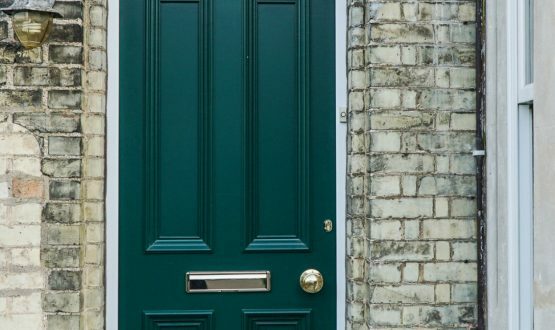 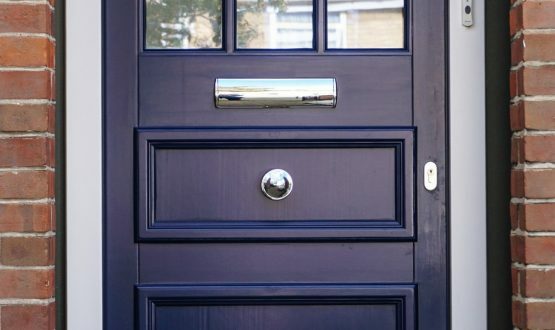 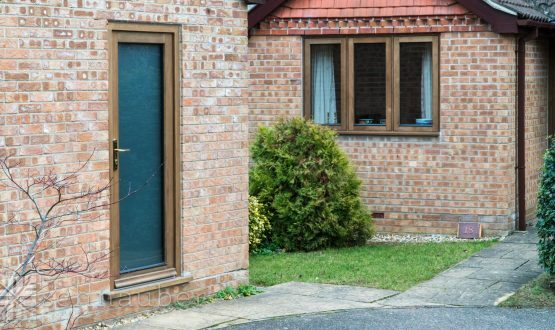 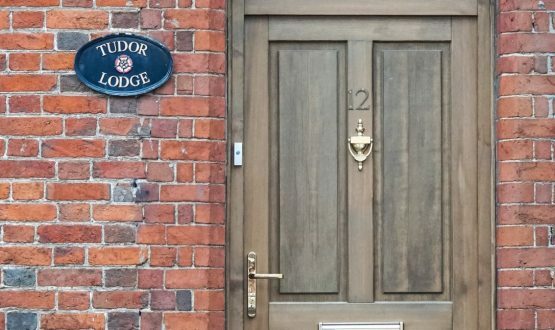 The time required to install new French timber doors will depend on what is being replaced. 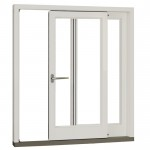 If the French doors are simply replacing an existing set of French doors then the installation typically takes 1-2 days. 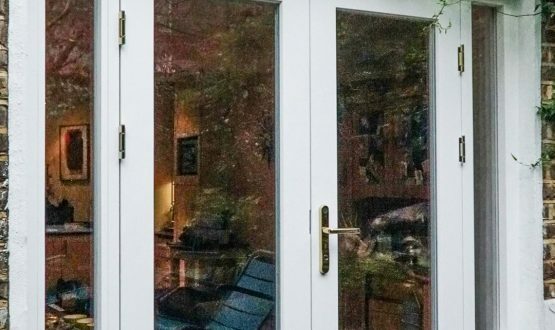 If windows are being replaced with French doors this will take longer. 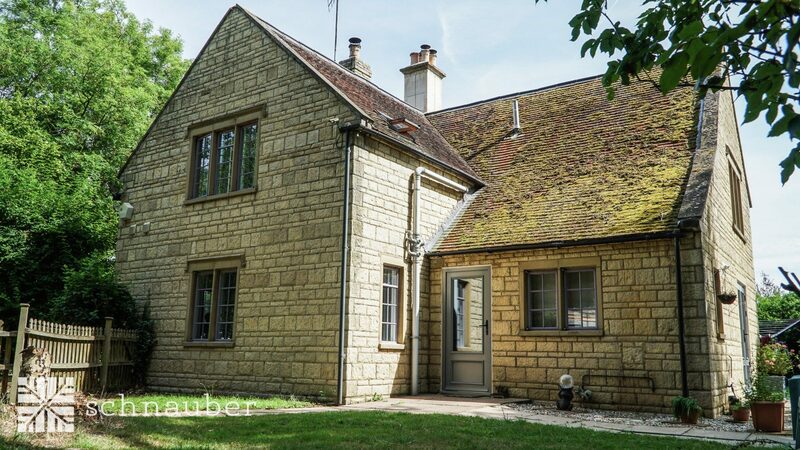 Please contact the office for further information - call 01223 929 293. 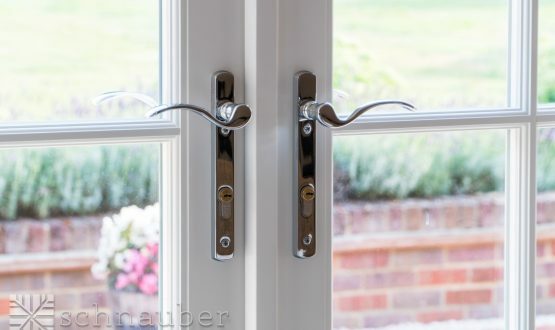 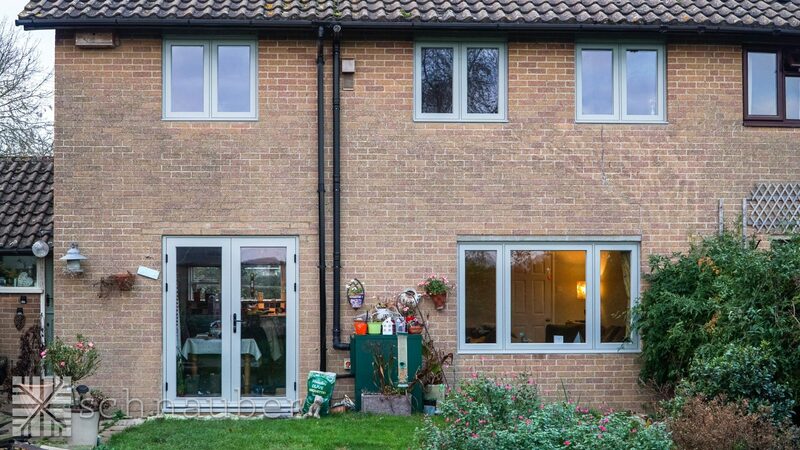 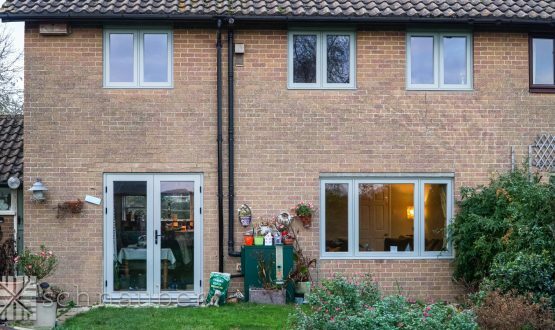 How easy are timber French doors to maintain once they have been installed? 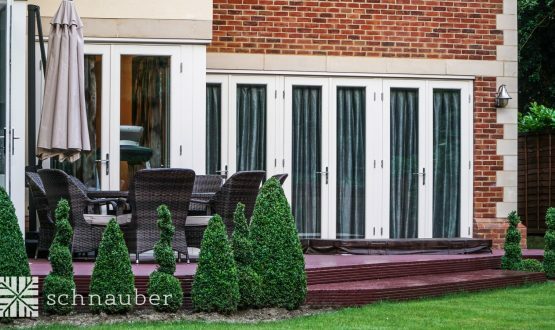 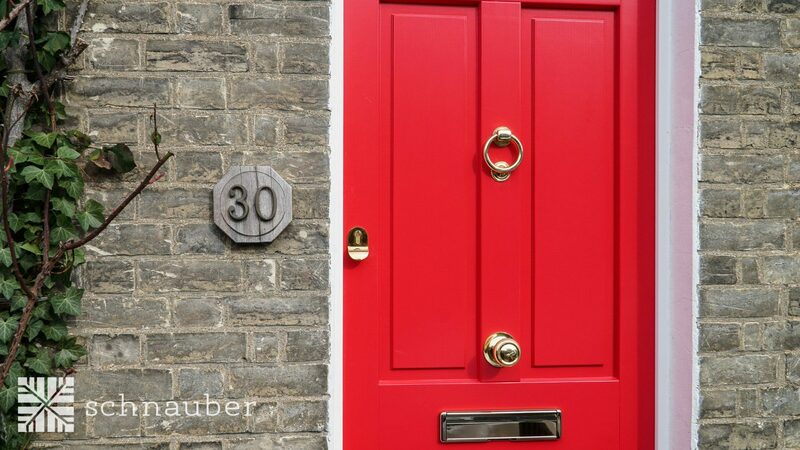 Schnuaber wooden French doors are pre-treated with a non-toxic wood preservative ensuring that maintenance is only required every 5- 10 years. 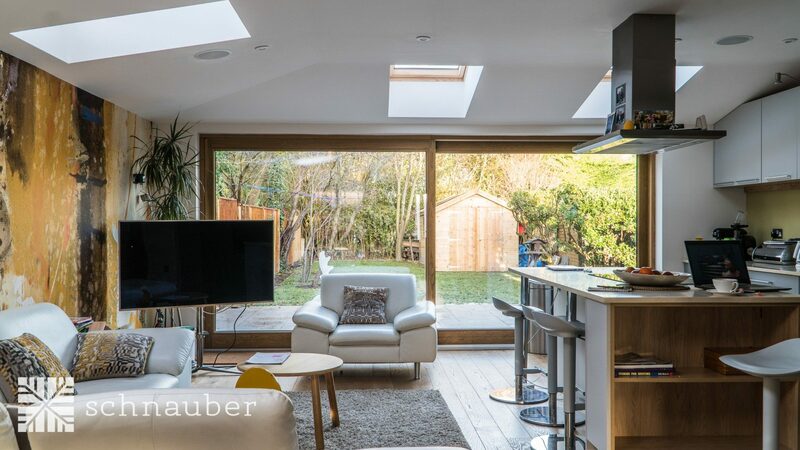 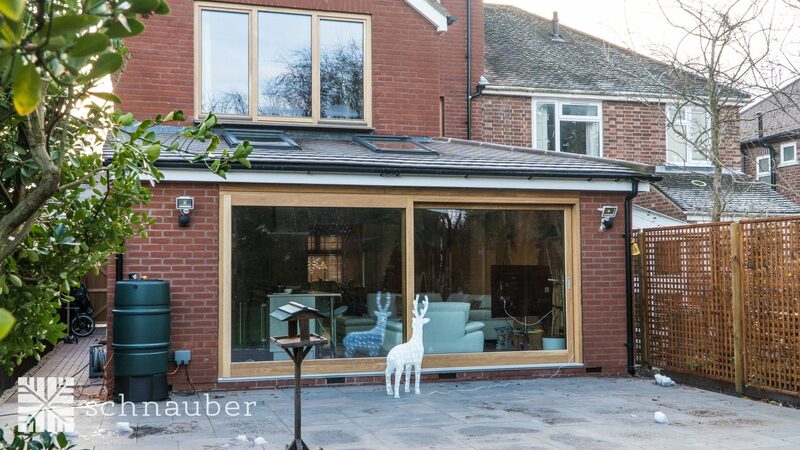 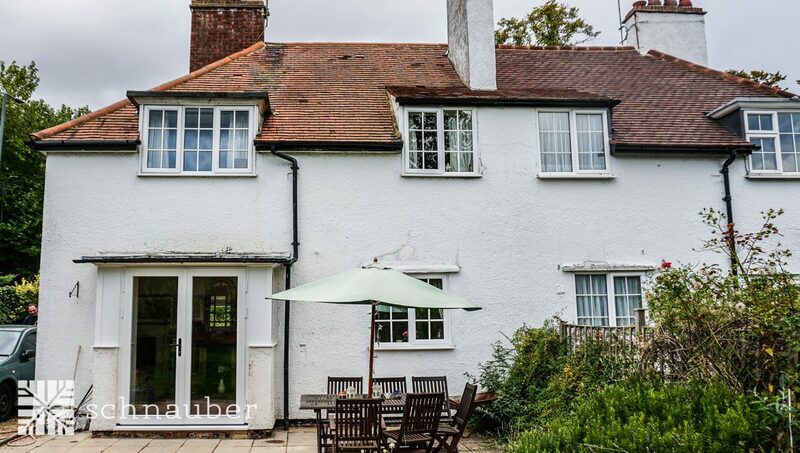 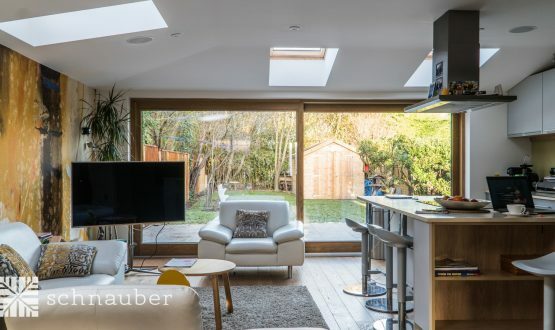 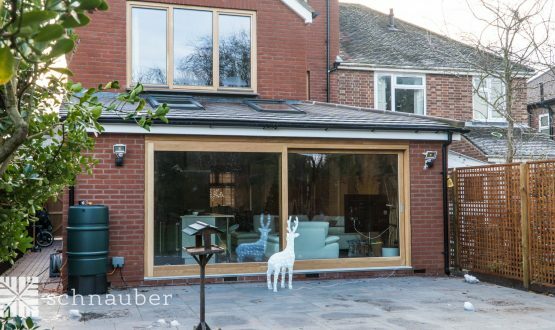 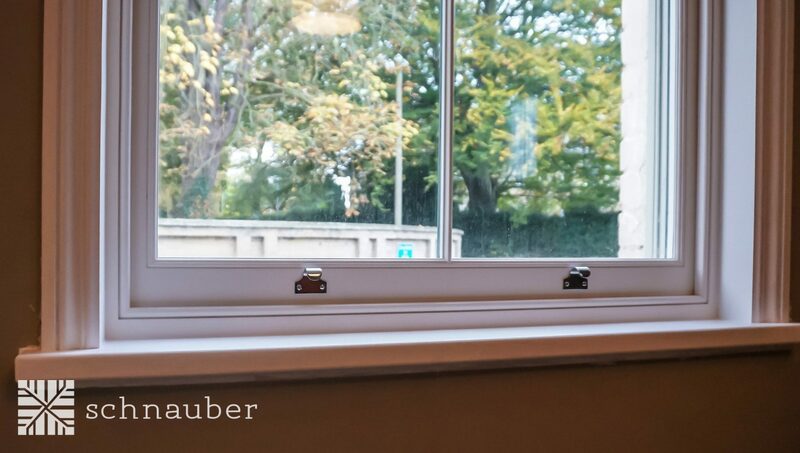 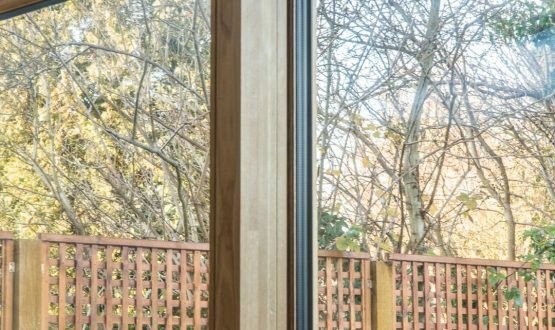 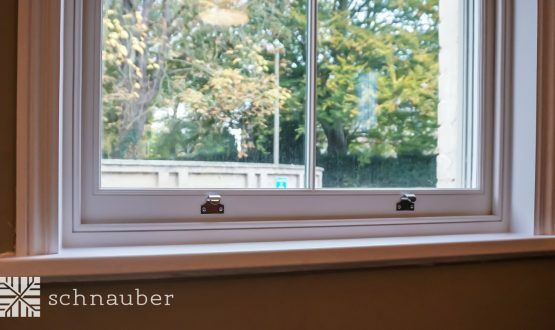 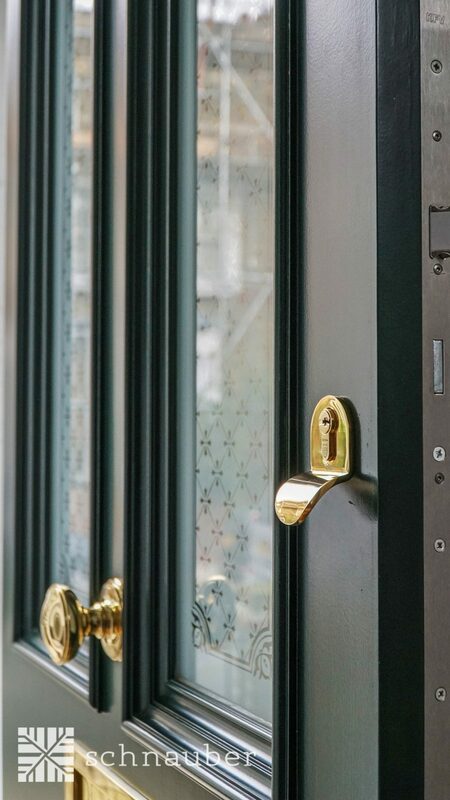 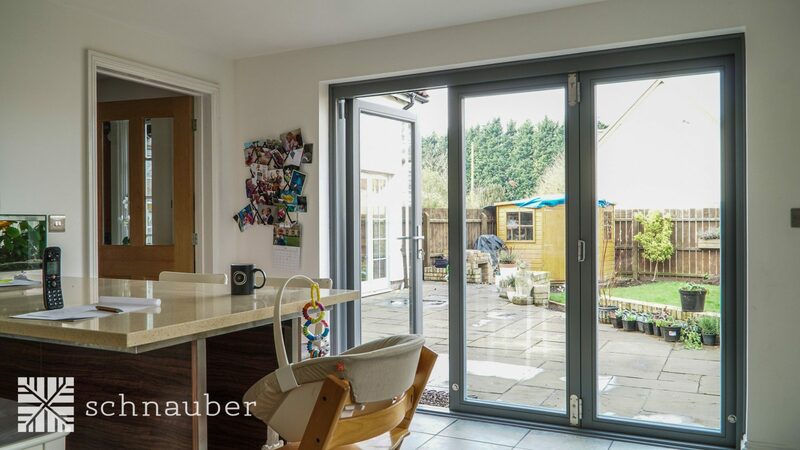 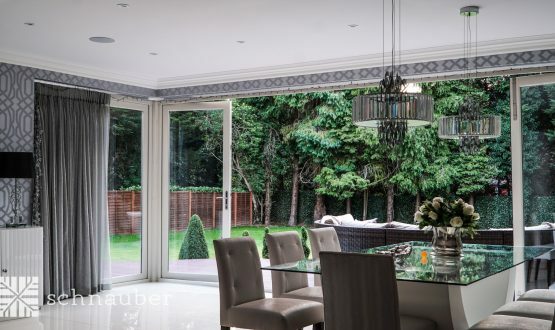 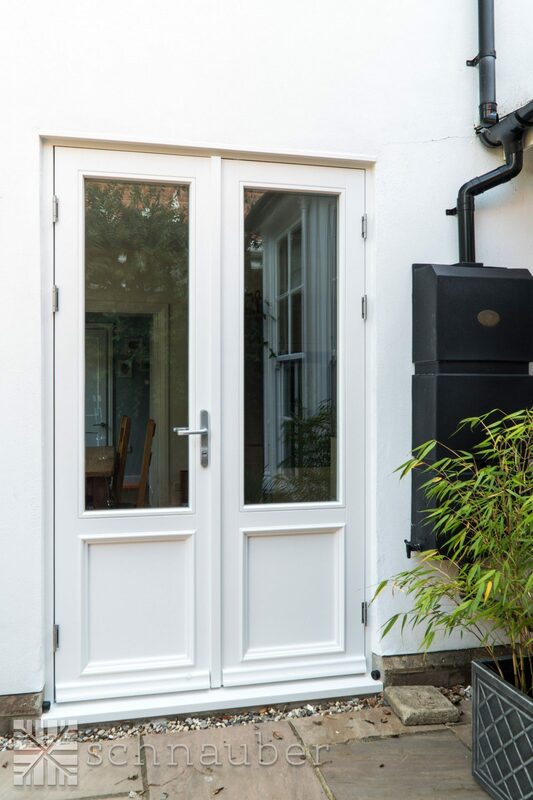 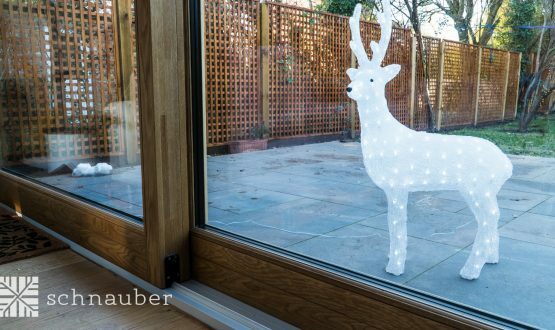 Whilst Schnauber’s wooden timber French doors offer the highest levels of thermal efficiency you will need to consider the impact of having such a wide expanse of glass in a room. 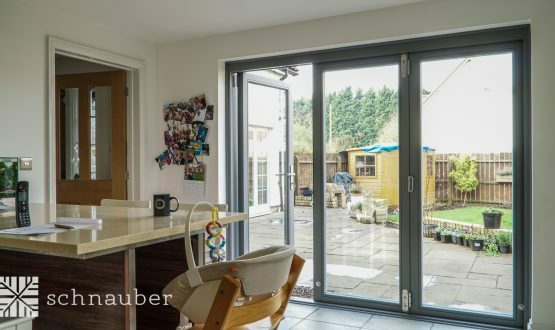 French doors require more space for operation so we will need to ensure that the radius of the swing will work, unhindered, in the space available.